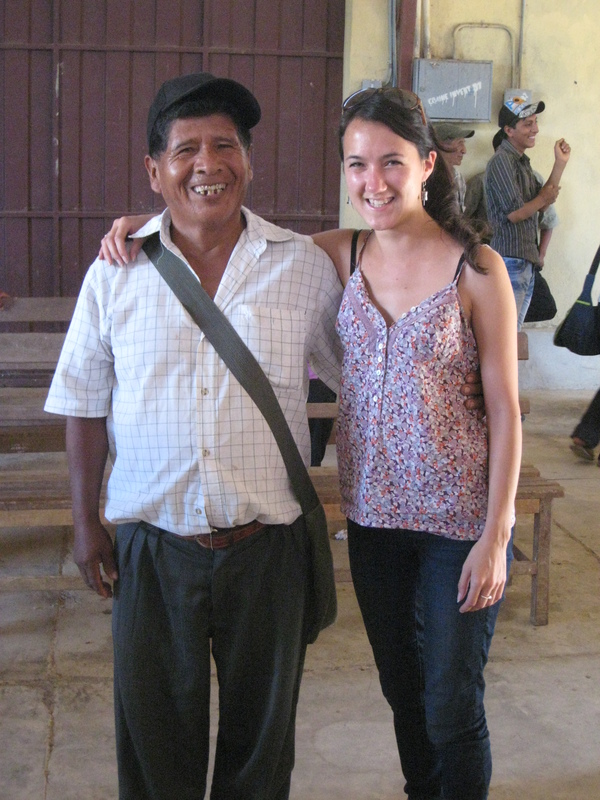 The second edition of Canadian Fair Trade Network’s magazine is out! 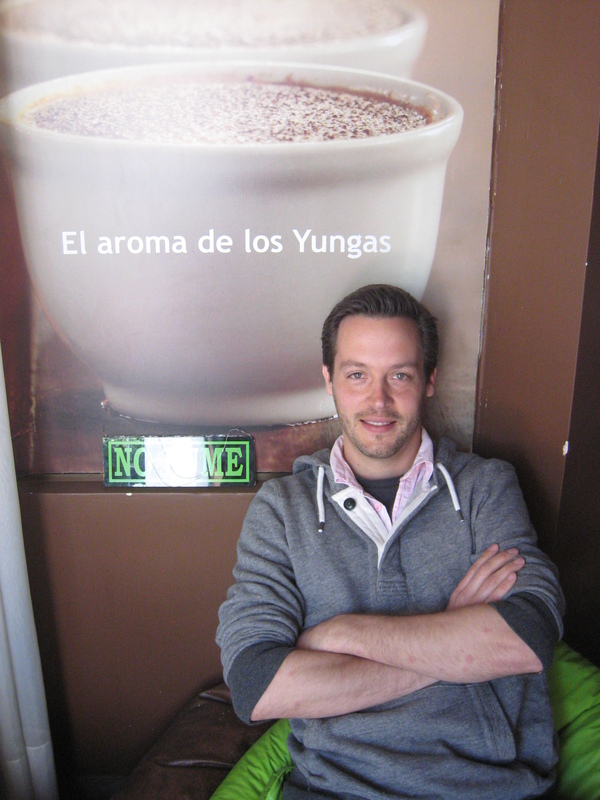 Check out pages 20-22 for my feature article about Bolivian coffee. As I count down the hours to my departure from Bolivia, I would like to extend a huge thank you to all of you for supporting this venture, in a whole host of different ways – whether it be in the form of generous donations for my fundraising campaign, moral support, words of wisdom, logistical help, care packages, hand-knitted hats and much more along the way. We raised a remarkable $4896, surpassing my $3000 target and all of my expectations. http://cci.akaraisin.com/Crossroaderfundraising/JoniWard All funds raised go directly to support Crossroads` vital projects and activities in their eight partner countries. 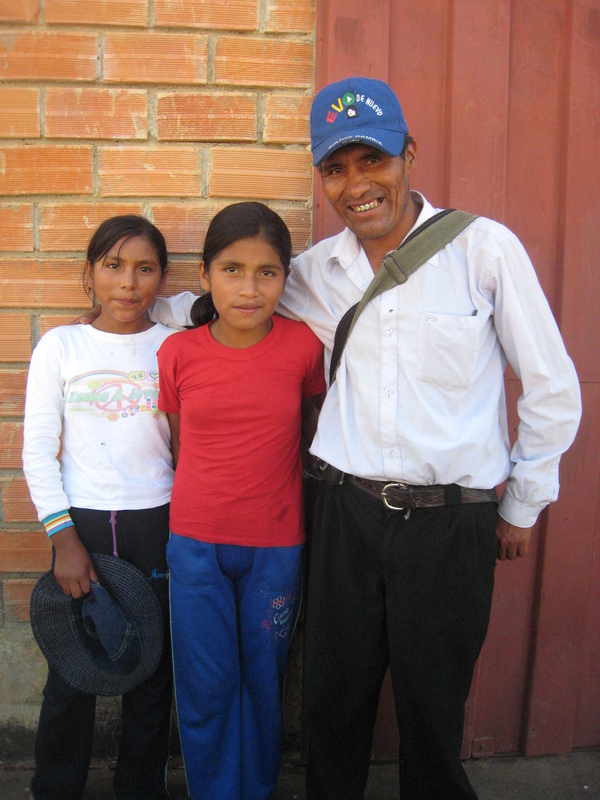 From myself and all the farmers and families I have worked alongside here in Bolivia, thank you. The impact of this project is significant and tangible. 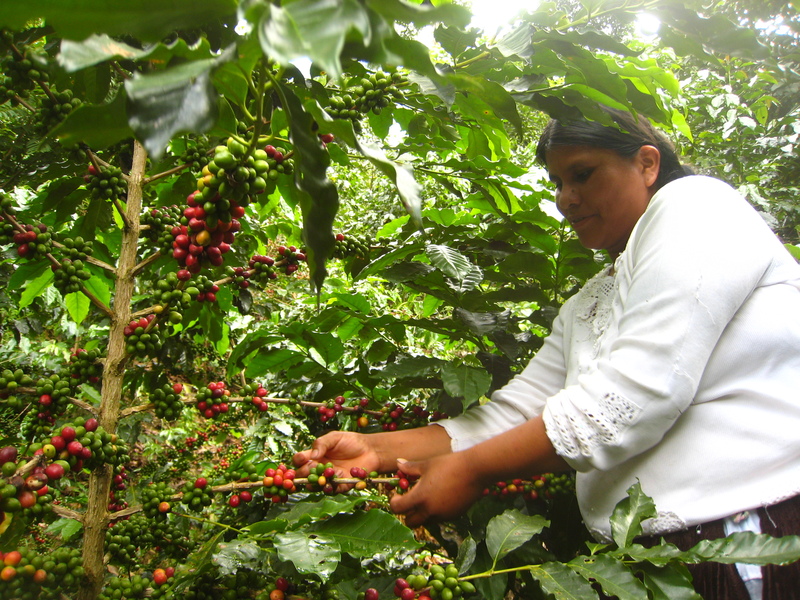 The livelihoods of rural Bolivians are being sustained through access to an expanded Canadian coffee market. 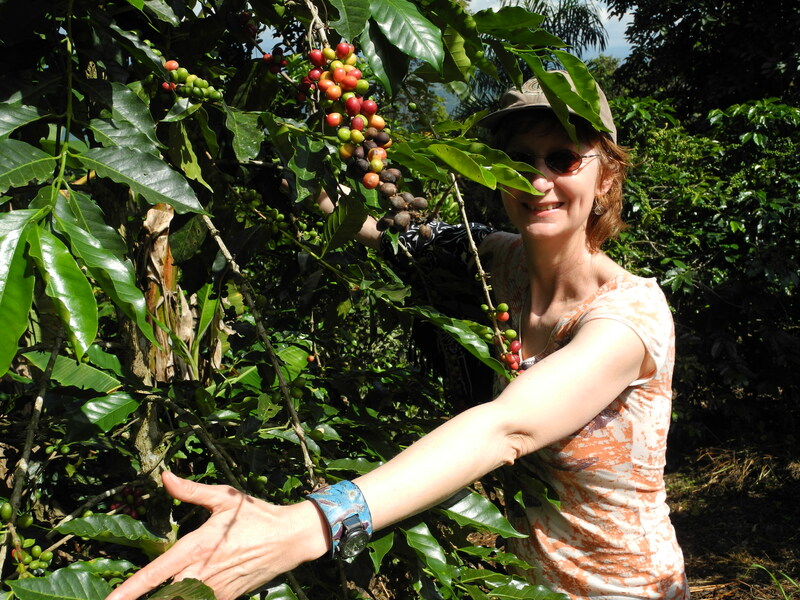 New relationships have been established; fair trade, organic coffee from COAINE cooperative will be available in Montreal, Ottawa and Nova Scotia later this year, as well as currently in Manitoba. (I am still not quite over the fact that I will soon be able to drink this very coffee only a couple of blocks from my home!) 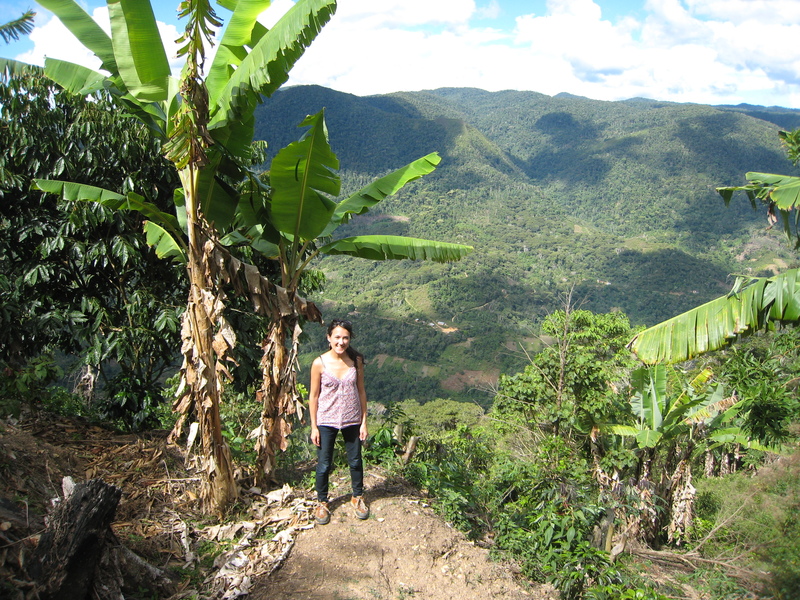 My volunteer successor will be heading out to Bolivia in the coming weeks, ensuring the project’s long-term sustainability. It has been an incredible, enriching, humbling journey, both personally and professionally, and I am profoundly grateful for your interest and support. With the recent tragedy of the collapsed garment factory in Bangladesh, where the horrifying death toll has now reached over 900 people; it is acutely apparent that our collective progress towards safe and fair working conditions has an awful long way to go. 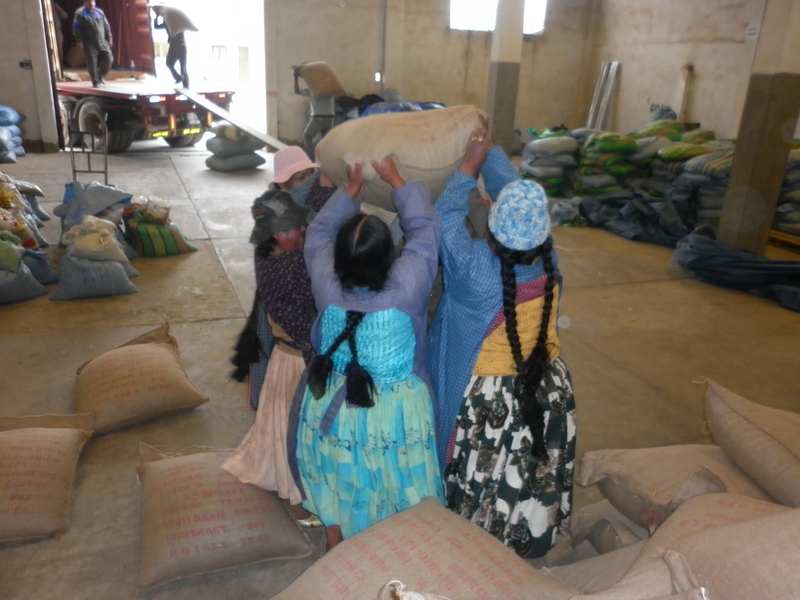 As millions of people toil daily in deplorable conditions, creating item after item to be sold cheaply in the West, exercising our purchasing power to seek out direct or fair trade products is ever more important. From the comfort of our privileged lives, it is all too easy to let distance cloud our perspective and numb our ability to act. We all have the power to make a difference. We all have a responsibility to reflect upon the purchases we make and the people behind the products we consume. After all I have learned and witnessed here in Bolivia, I find it hard to believe that we can drink coffee for the low prices we pay. Coffee should not be cheap. 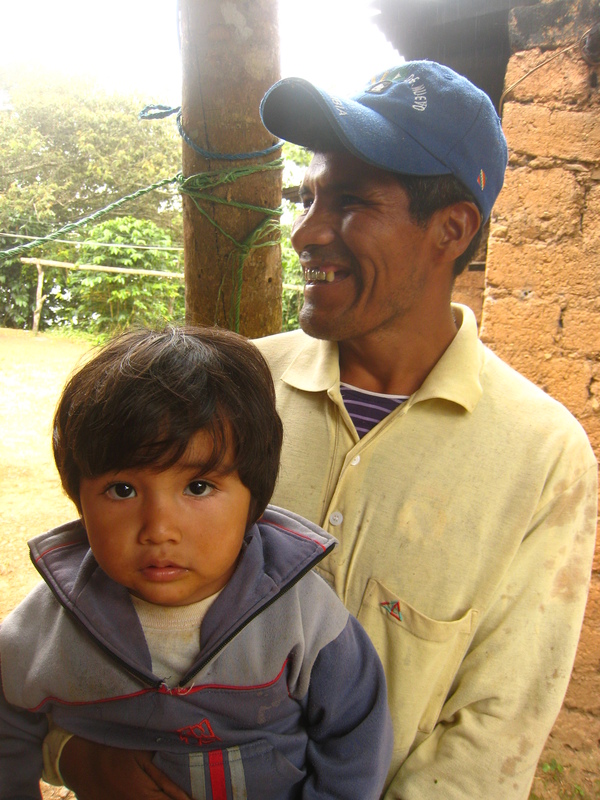 The livelihoods of farmers and their families are at stake. 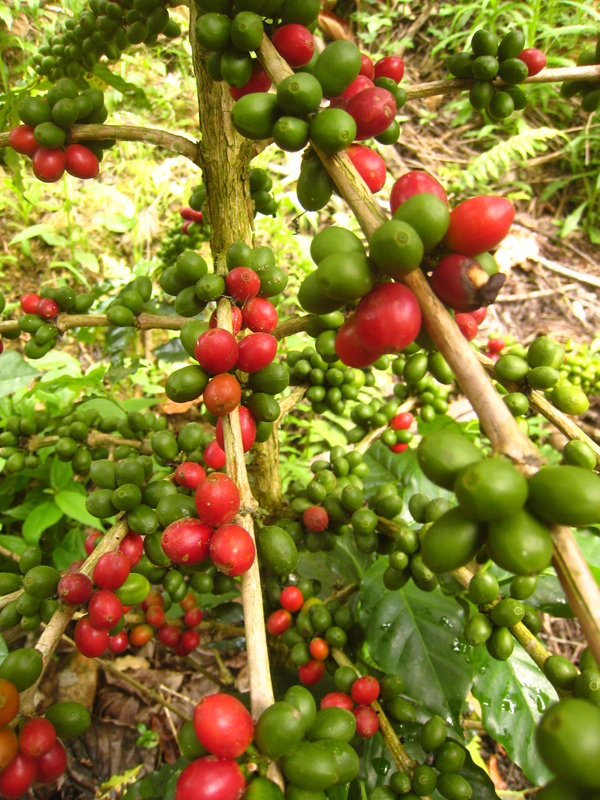 Every single coffee bean goes through a long, laborious process before it makes it into your steaming cup of espresso or latte. So the next time you’re browsing a supermarket aisle or at the counter of your favourite café, I urge you to take a moment and spare a thought for the farmer and the family behind your morning cup. 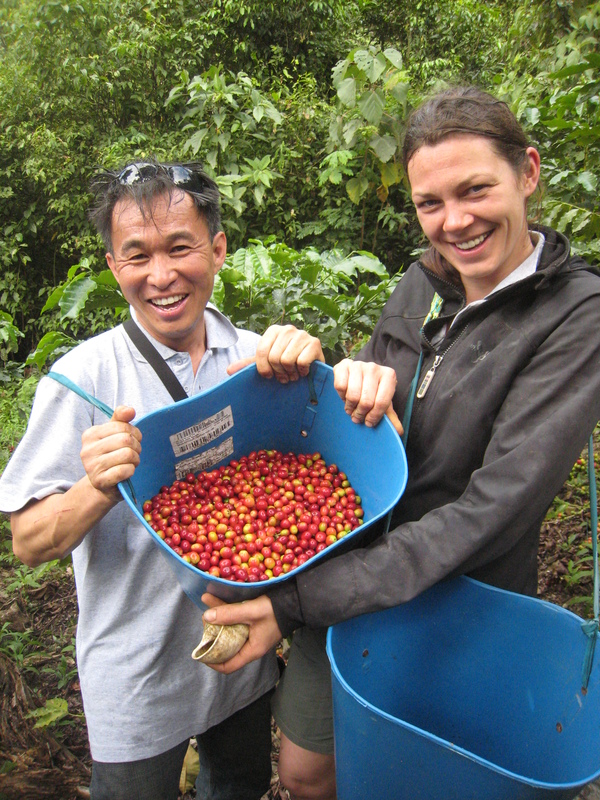 Be curious, be accountable, ask questions beyond looking for logos, seek out direct or fair trade coffee. And know that you will be changing lives in the process. Rounding off my Crossroads’ mandate with a week as inspiring and motivating as the one I have just experienced, is truly a gift. 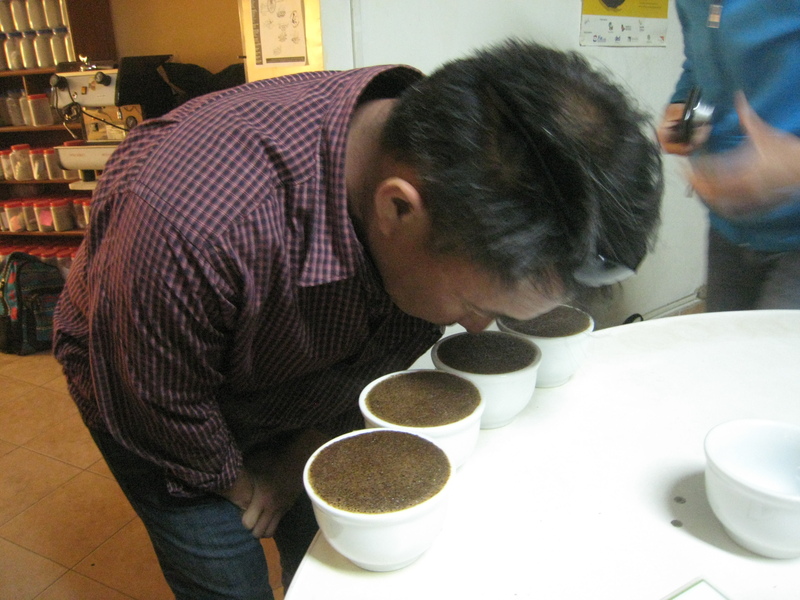 From April 24th – May 1st, I hosted five Canadian micro-roasters (four invitees, one self-financed), with an objective of establishing direct trade relationships. We braved Death Road, visited coffee plantations, met farmers and their families, toured facilities, cupped coffee, discussed potential partnerships and negotiated contracts. Hailing from Quebec, Ontario, Nova Scotia and Manitoba, the group was diverse – from one micro-roaster who was enjoying her first trip outside North America, to another who has 40 such coffee-origin trips under his belt. 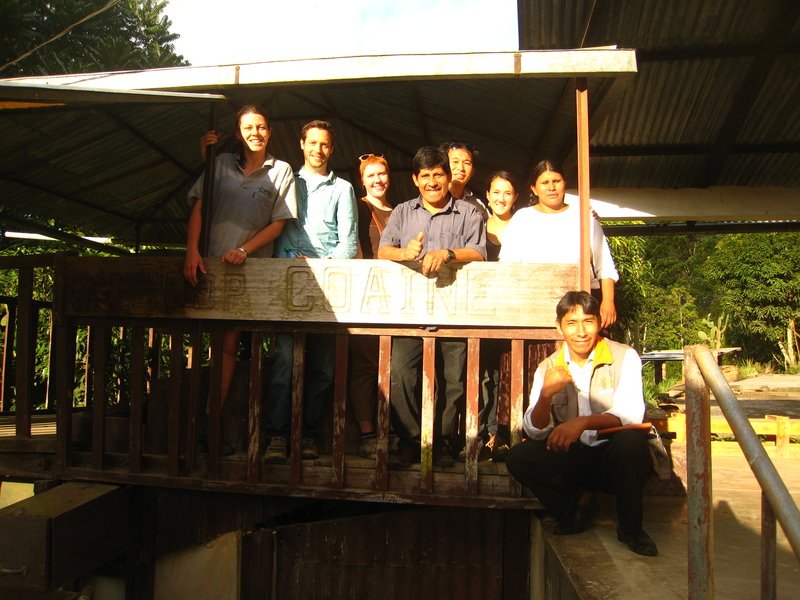 Each had unique experiences and knowledge to offer, along with a shared passion for coffee and a commitment to direct trade. I learnt a huge amount throughout the visit and am filled with respect and admiration for the individuals I had the pleasure of hosting. 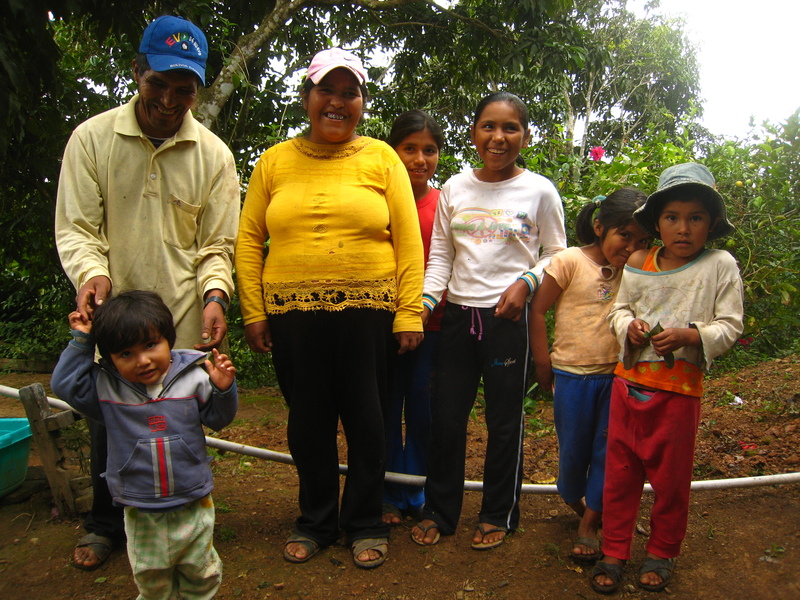 We visited coffee plantations at altitudes ranging from 1200m to 1700m, spending time with farmers and their families. 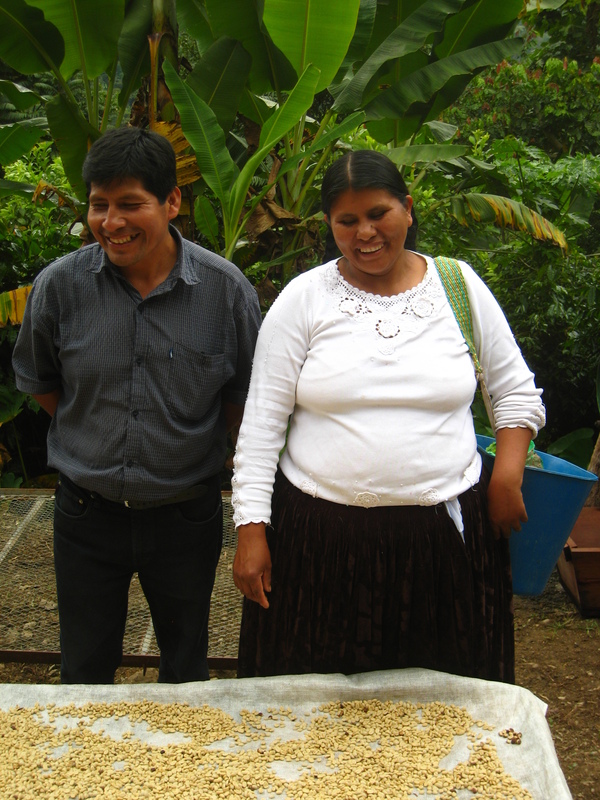 The fair trade premiums that COAINE receives are essential for the livelihoods of these families. 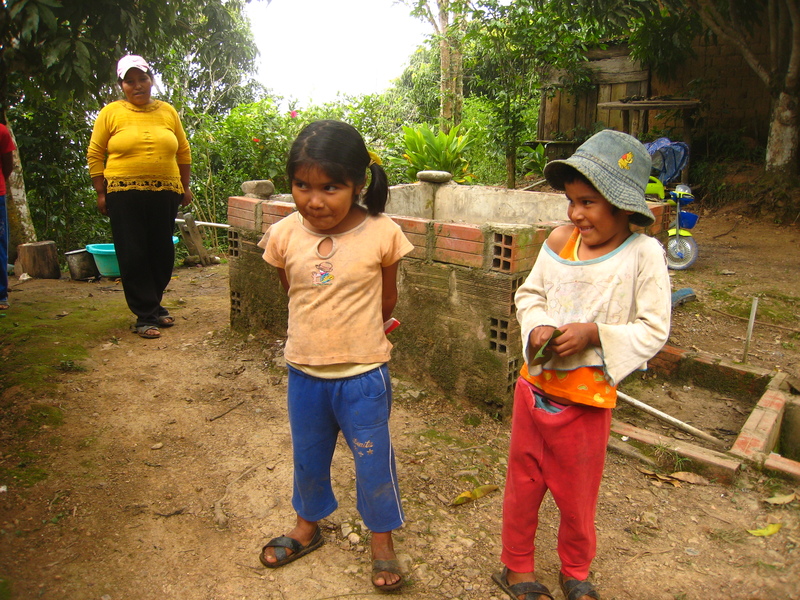 Beyond ensuring a fair wage, fair trade enables access to health services, education and other social services which would otherwise remain out of reach for these rural communities living in poverty. 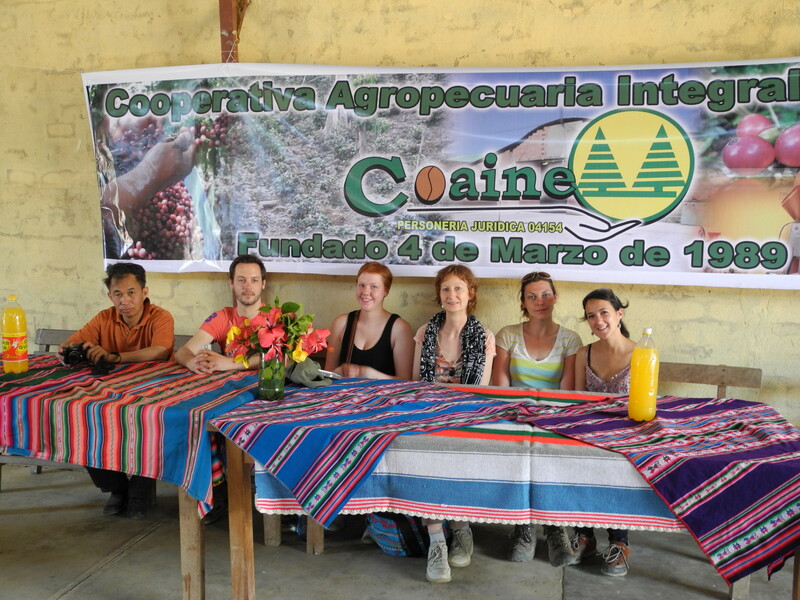 While visiting the coffee production zone around Caranavi, we connected with several members of COAINE in the community of Niño Jesus. After an enormous lunch, lively discussion ensued and it was inspiring to see producers and micro-roasters learning from one other, and listening with respect and receptivity. 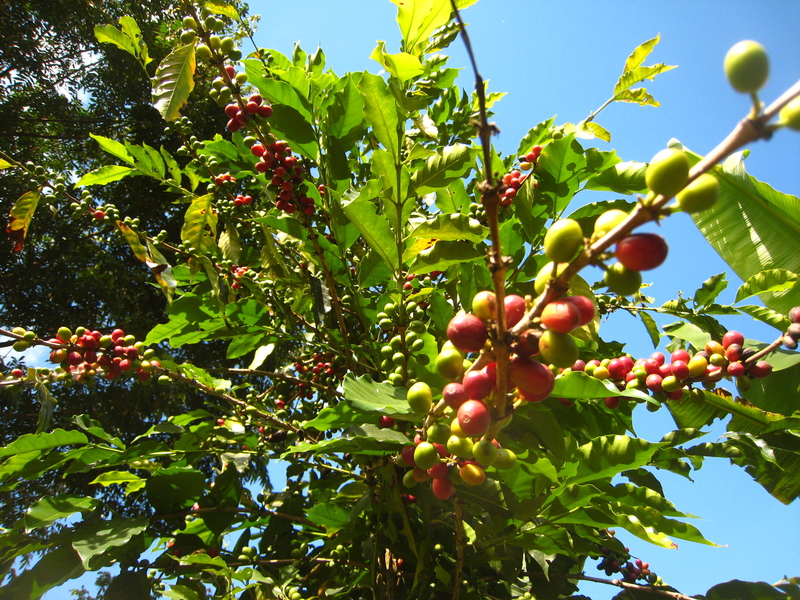 The cosecha (harvest) for coffee begins in April and continues through to August. 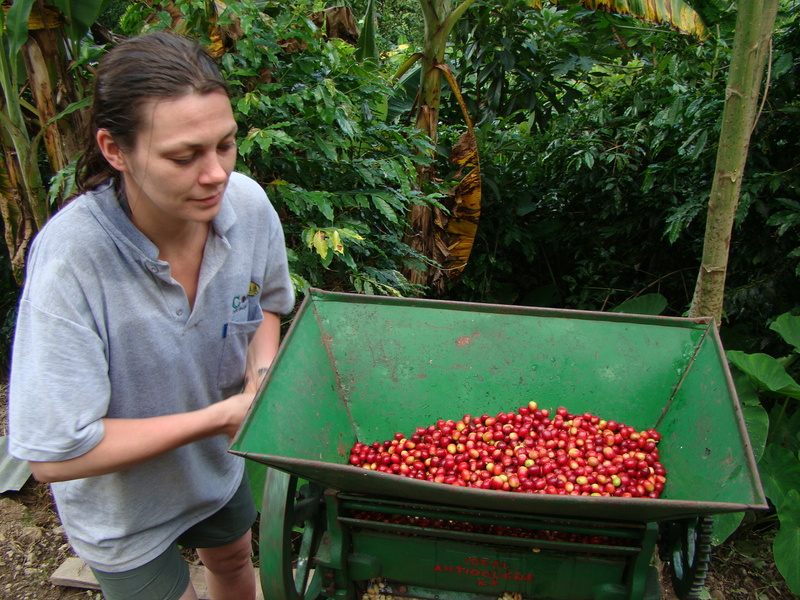 We were able to try our hand at picking coffee cherries, as well as observe the washing, pulping, fermenting and drying processes. 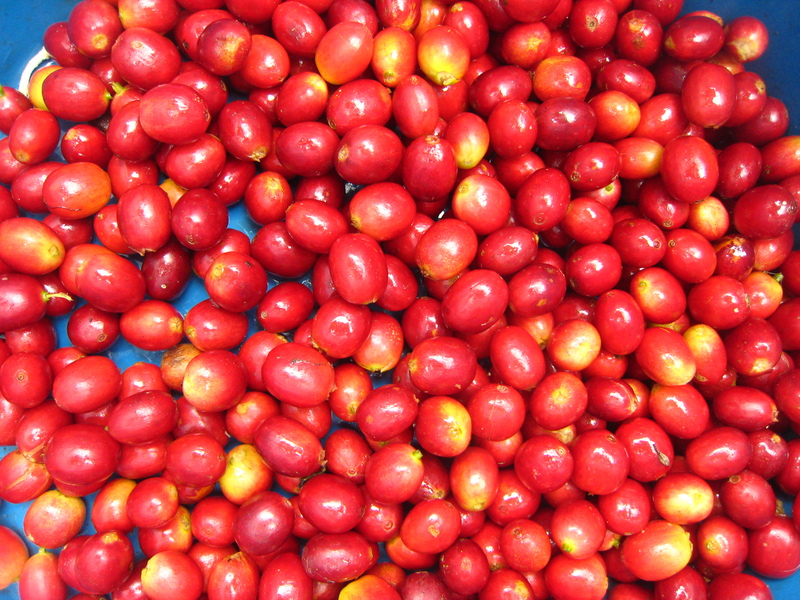 COAINE produces four main varietals of coffee : criolla, caturra, catuai rojo and catuai amarillo. 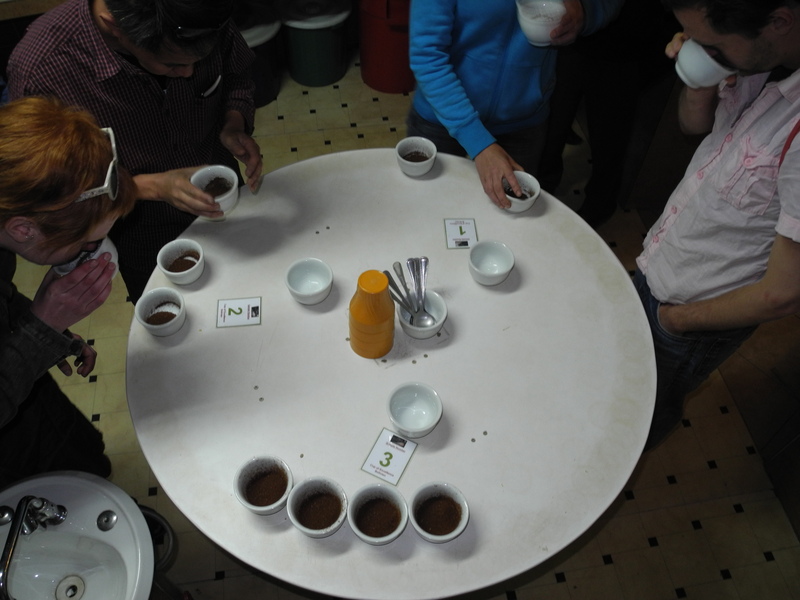 Our coffee cupping session took place up at FECAFEB`s facilities in El Alto. 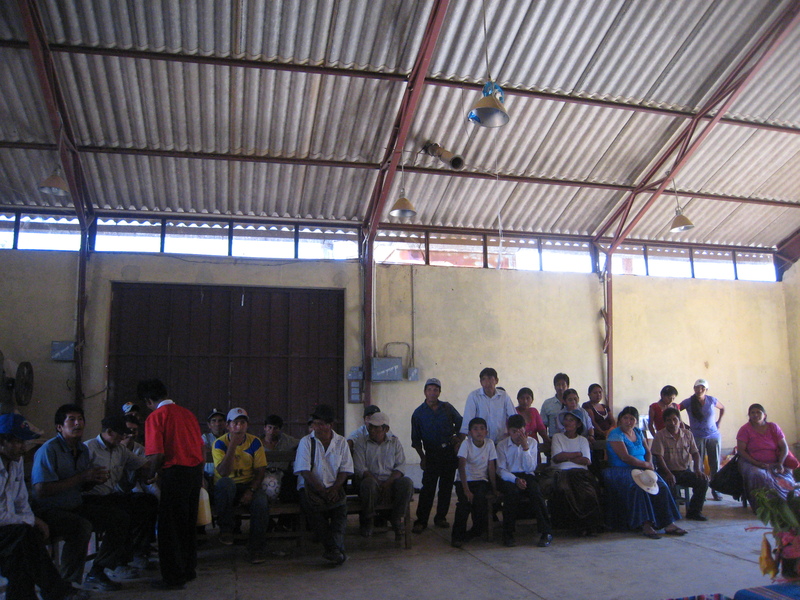 FECAFEB (La Federación de Caficultores Exportadores de Bolivia) is the umbrella organization for all Bolivian coffee cooperatives. 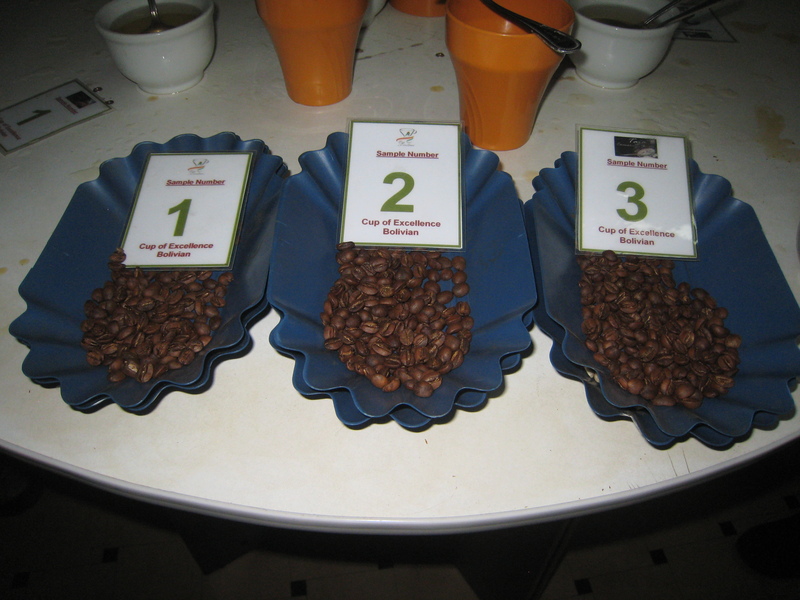 Coffee cupping is the method of evaluating various characteristics of a particular coffee bean. 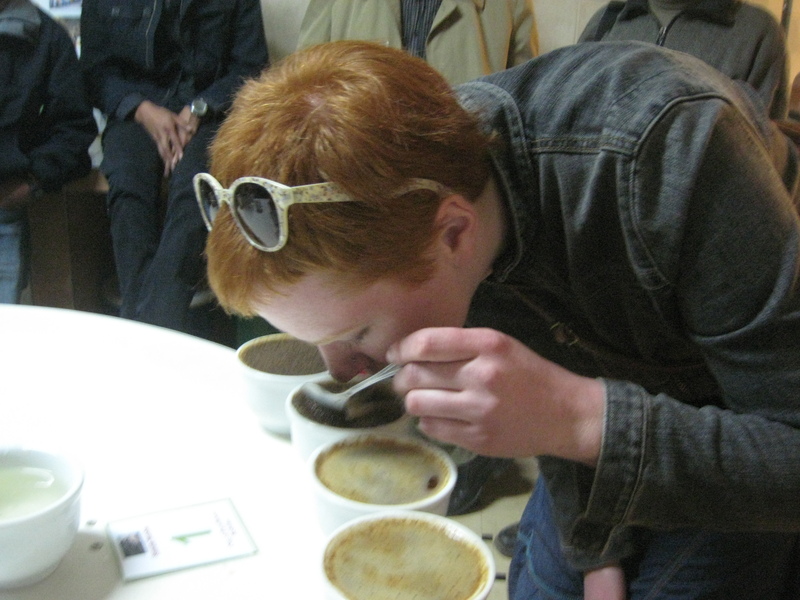 Much like wine tasting, coffee cupping is a complex process, determining taste, flavour, fragrance and aroma. 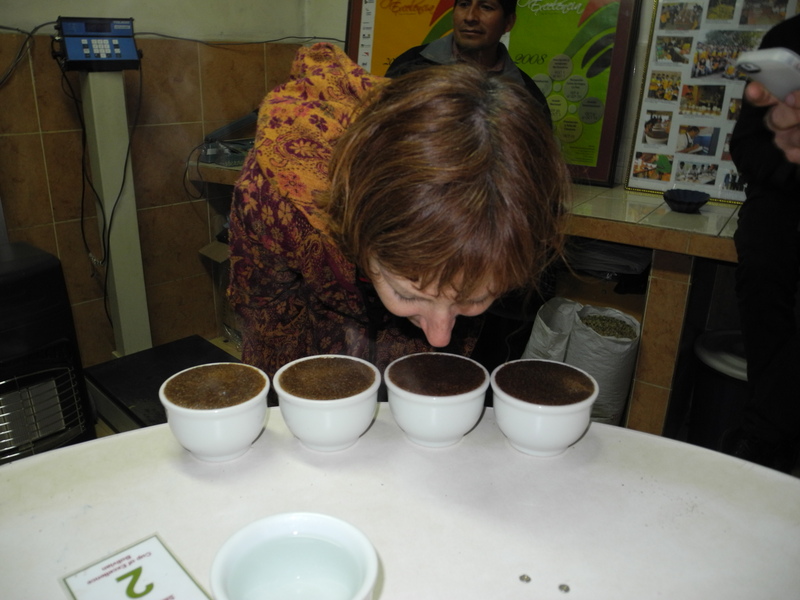 By sniffing and tasting the coffee at different stages, it is possible to evaluate attributes such as balance, body, acidity, sweetness, after-taste, clean cup and uniformity. 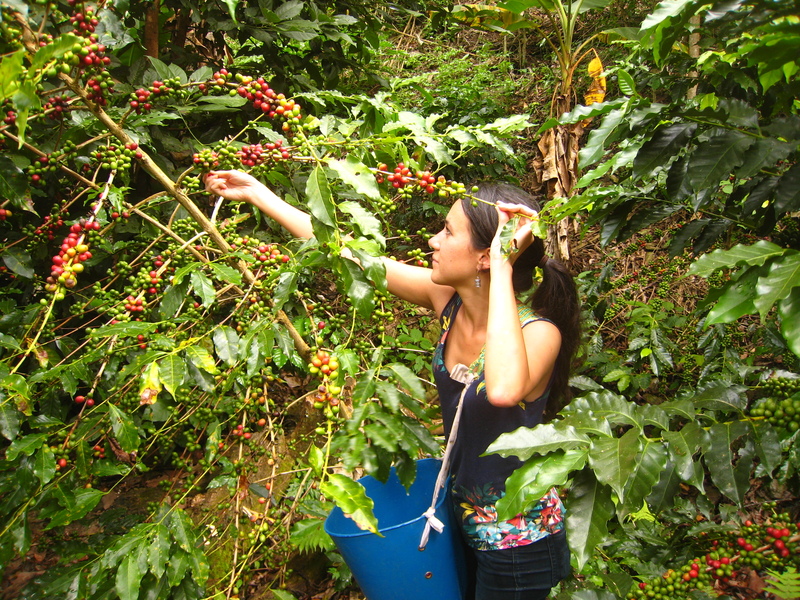 At this early stage in the harvest, fresh coffee beans from only the lower altitudes were available for tasting. 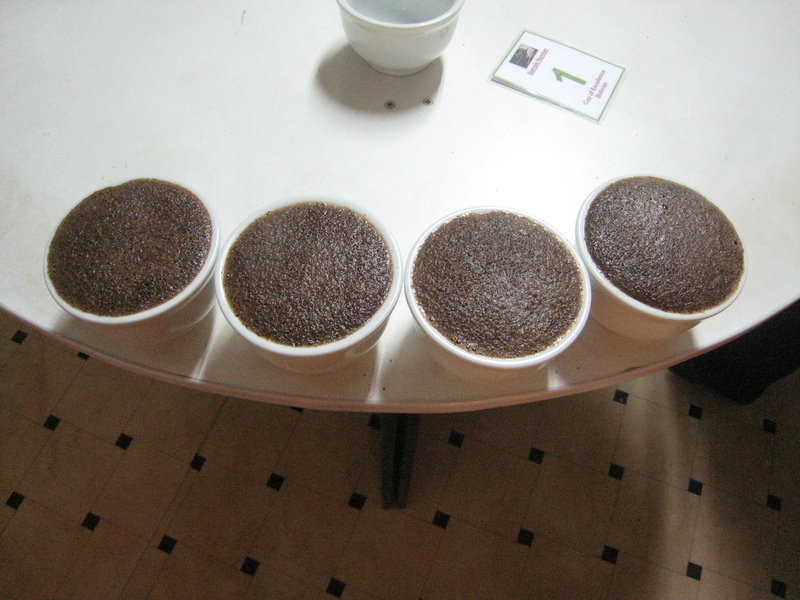 We cupped three batches of coffee beans all from the same farm: criolla, catuai rojo and a combination of the two. 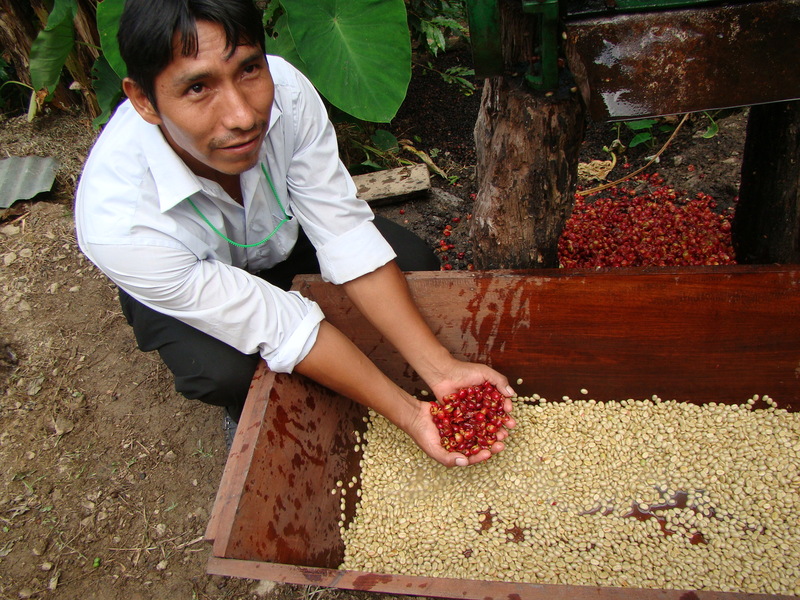 Extreme care was taken to treat the beans to the exact same process to produce the most accurate results. 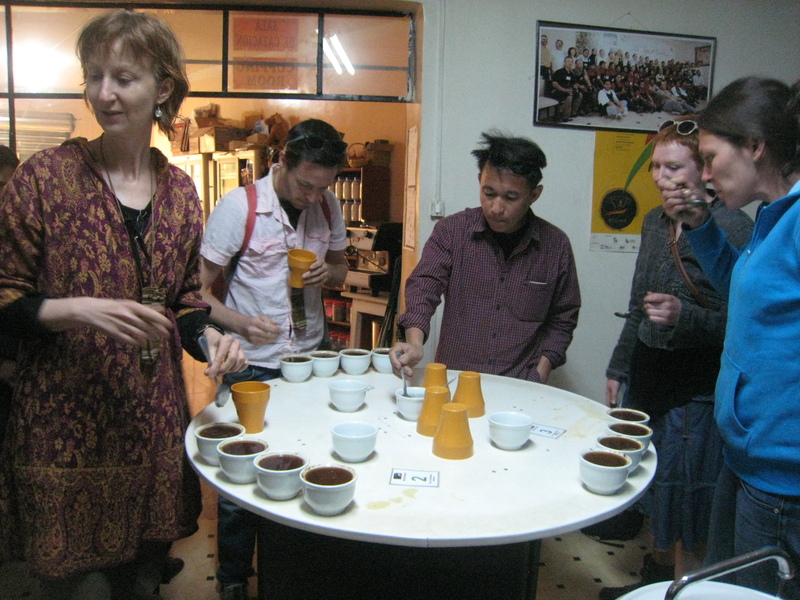 Four cups of each batch were prepared in order to identify consistency or lack thereof. Much sniffing, slurping and silent rumination later, the merits of the coffee were discussed and the varietals revealed. 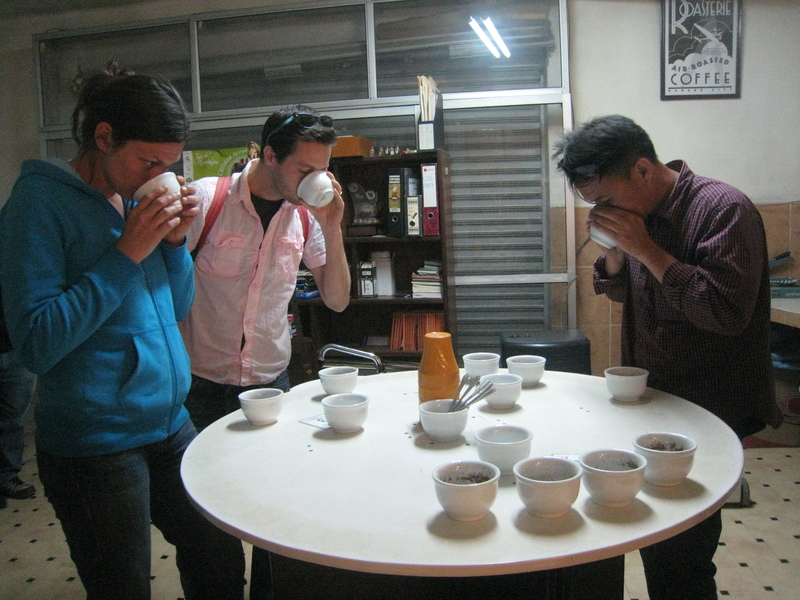 Incredibly, Jean-François and Lay Yong (both certified coffee cupping judges) were able to identify which of the three batches was the mix of coffee varietals during a blind taste test. Impressive! 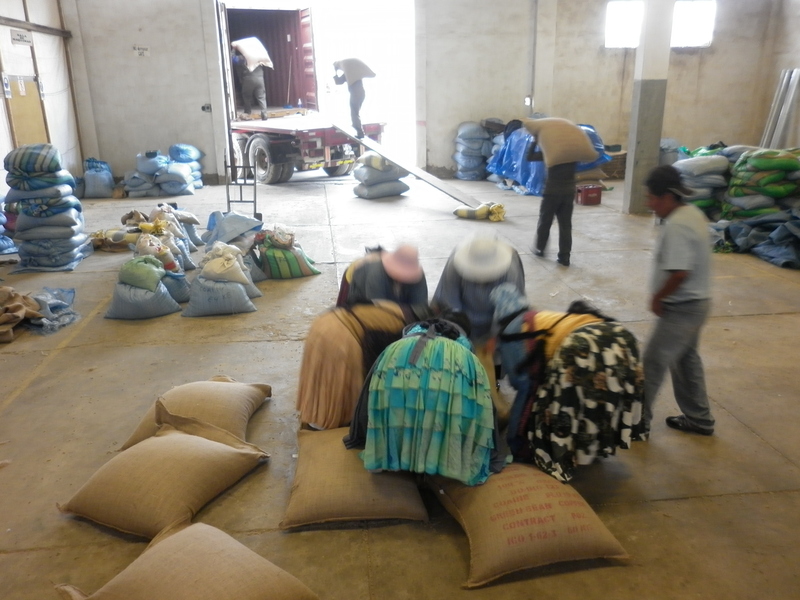 We concluded a productive week by visiting COAINE`s dry processing plant up in El Alto. 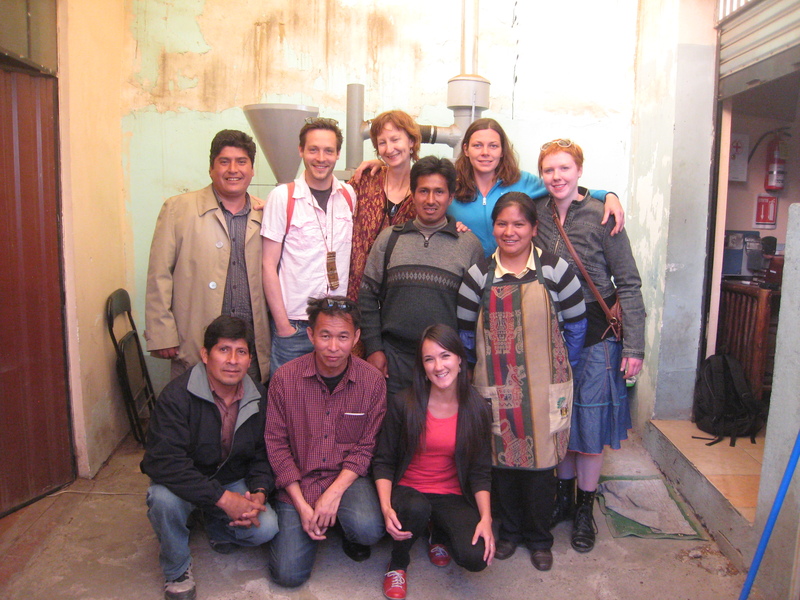 Each micro-roaster had an opportunity for some one-on-one time with cooperative members, with myself and another translator present. I am thrilled to report that both T.A.N. 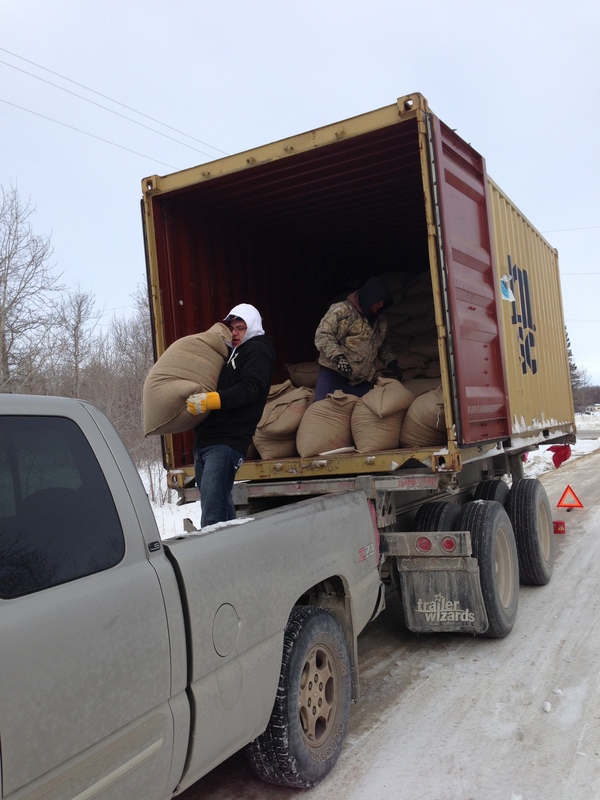 Coffee and Café St Henri negotiated contracts with COAINE and will be sharing a container from this year`s harvest! T.A.N. 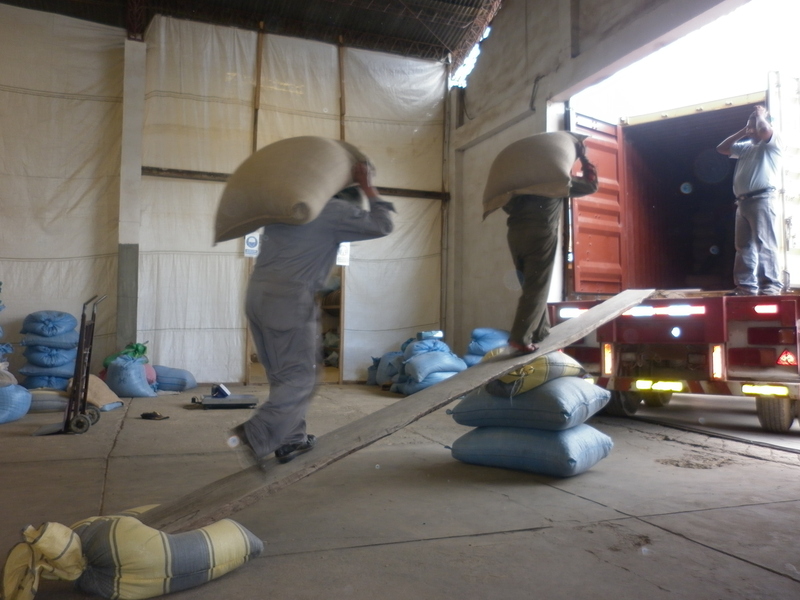 Coffee is importing 220 bags (at 70kg each) and Café St Henri, 60 bags. Furthermore, both micro-roasters are collaborating with COAINE to produce high quality coffee with unique specifications, relative to their markets. With this, I am more than delighted to realise that my Crossroads mandate has allowed things to come in a glorious full circle, that I could only dream of, seven months ago. Since Cafe St Henri is based in Montreal – with three cafés and a number of wholesale customers – I will be able to drink COAINE’s fair trade coffee only a couple of blocks from my Montreal home. Having a personal connection with the producers behind my morning coffee is a truly wonderful prospect! Heartfelt thanks to everyone involved in the success of this visit and these partnerships. I can say with confidence that Crossroads is bridging a much-needed gap with its international development projects such as this fair trade initiative. Real change is happening. Lives are being transformed. I write this having just waved off our visiting Canadian coffee roasters at the airport. It was an incredible, inspiring week and a wonderful way to wrap up my volunteer mandate. Stay tuned for a full report! 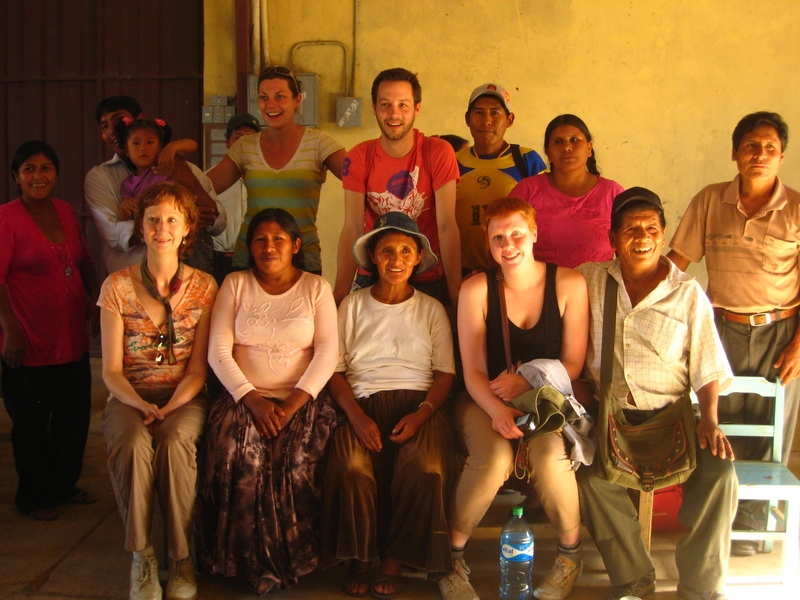 Unbelievably, I now have a little over ONE WEEK remaining in Bolivia…these seven months have flown by! 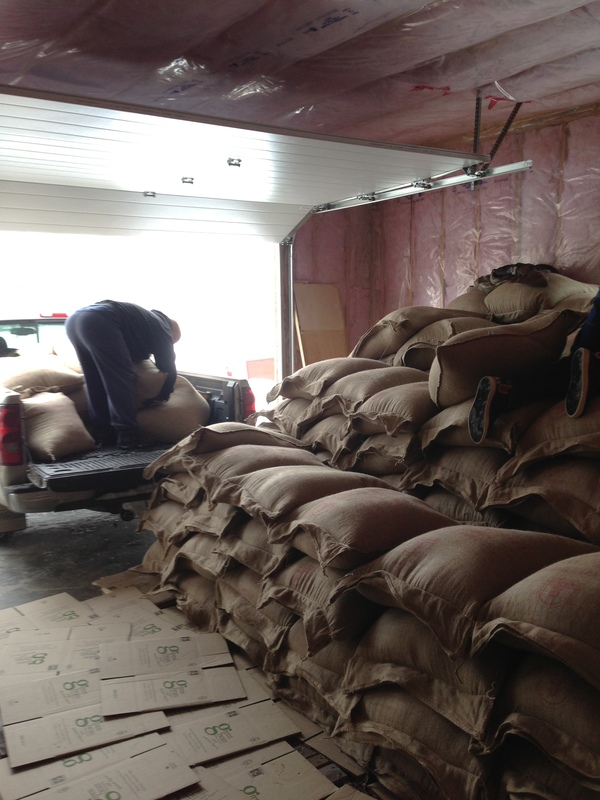 Green Bean Coffee Imports received a very special delivery a couple of weeks ago. 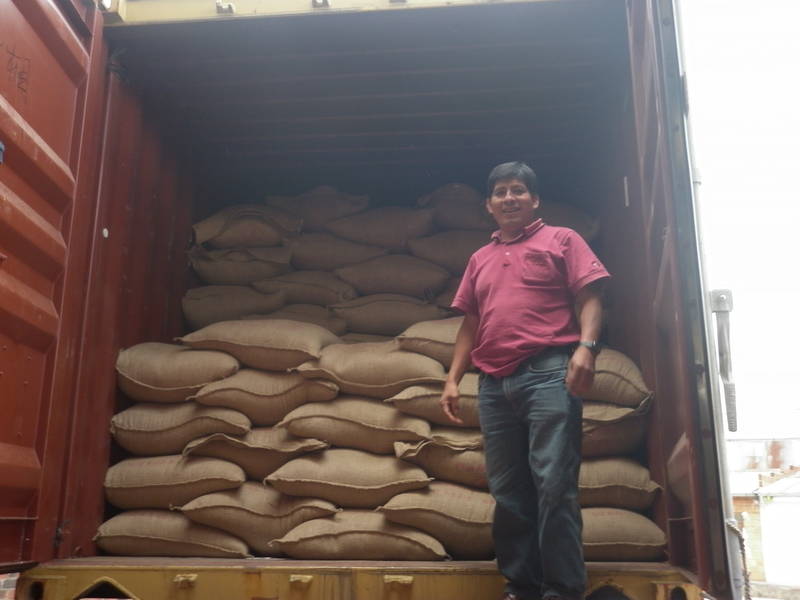 With much anticipation, the container of organic and fair trade certified coffee negotiated back in November finally ended its long journey from Bolivia. 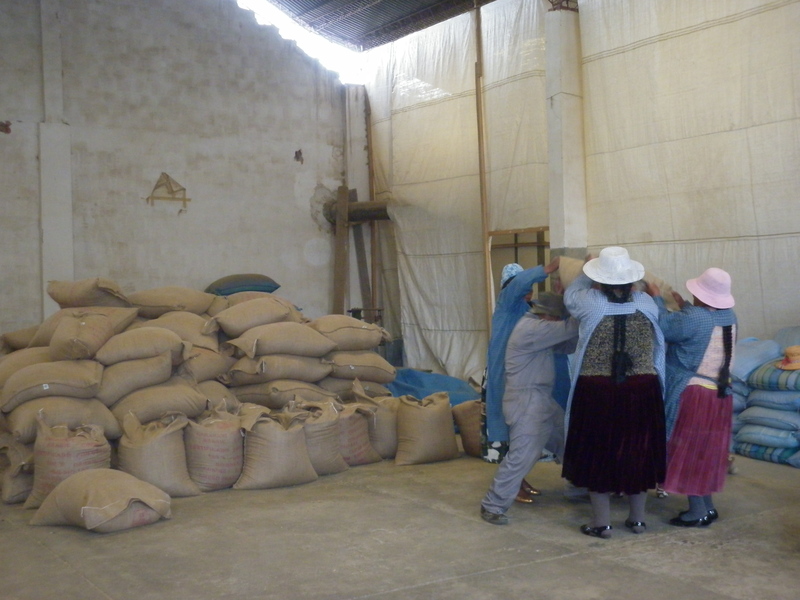 Back in early January, I headed up to COAINE`s coffee processing plant in El Alto to observe the coffee being loaded. 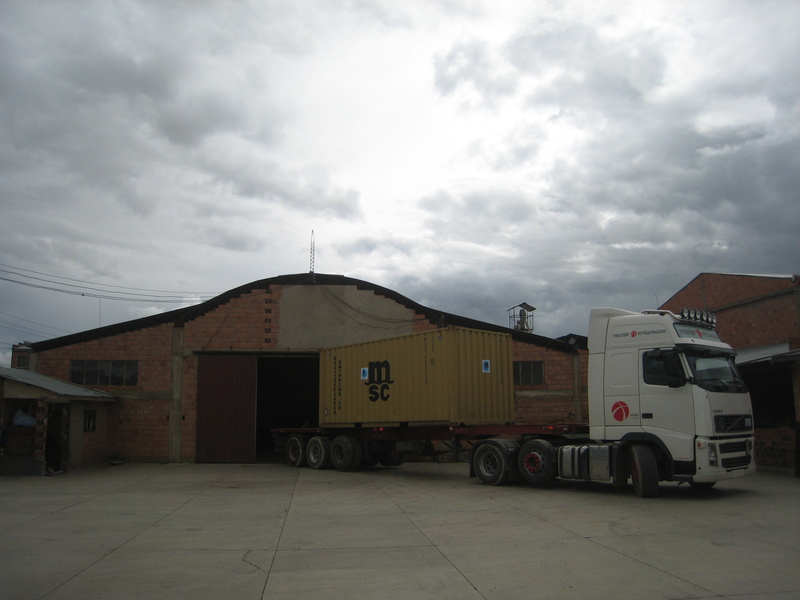 The truck arrived with typical Bolivian punctuality (7 hours late) and after much manoeuvring to park, the loading finally began. 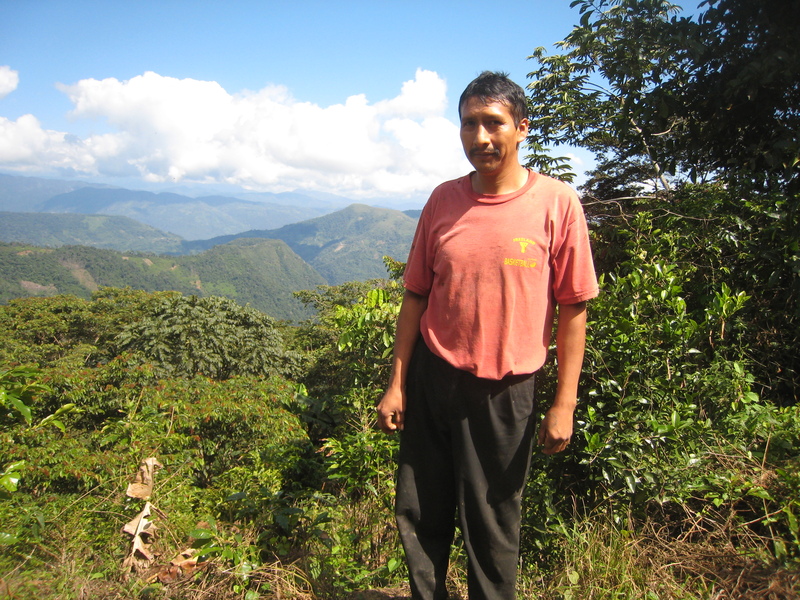 This was the height of the rainy season and several of the cooperative`s workers had been held up in Caranavi due to mudslides, leaving the team depleted. 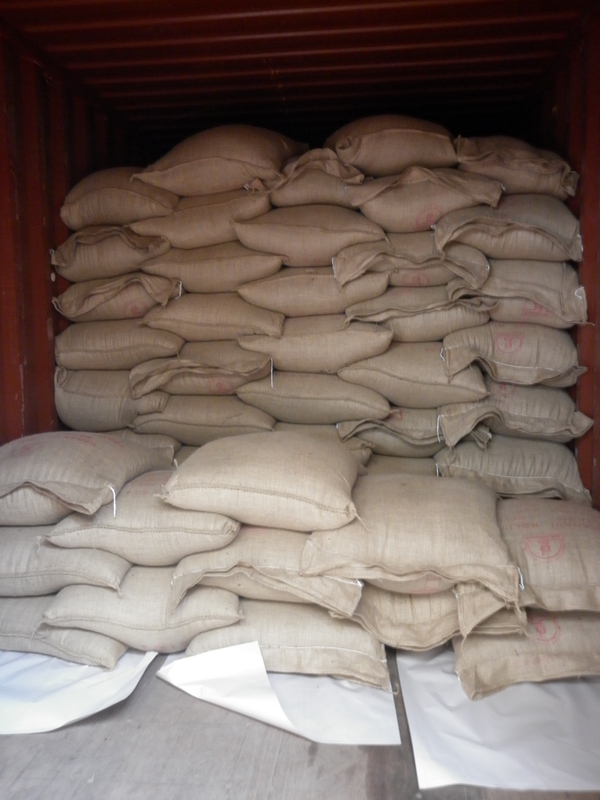 The container consisted of 260 bags at 60kg (132lbs) each. I noticed a distinct lack of dollies or other loading equipment and soon discovered why. 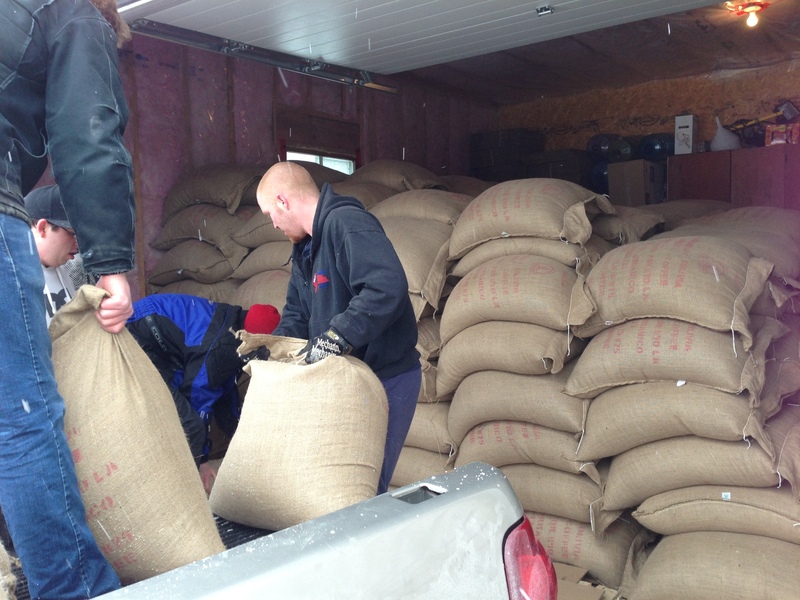 The loading of the coffee was an impressive show of teamwork. 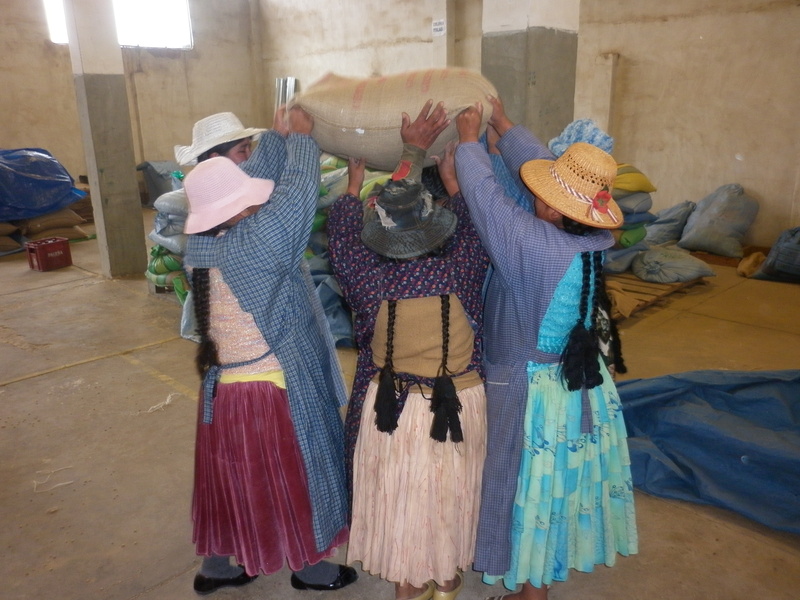 Five women, with their billowing cholita skirts and identical two long plaits, stood in a circle and together hoisted each bag onto the shoulders of one of five men, who in turn, strode along a narrow plank of wood into the truck, where another two men carefully stacked the sacks. The entire process took a couple of hours, after which many clinking crates of beer appeared. 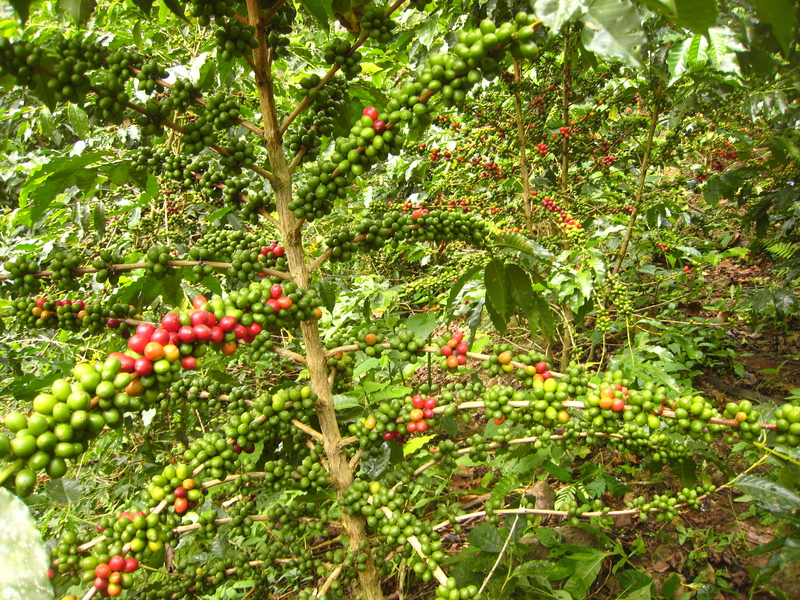 From El Alto, the coffee travelled to Chile`s Port of Arica, set sail northwards to Montreal and finally arrived by train at its destination in Clandeboye, Manitoba, where it was unloaded (by an altogether different method) in sub-zero temperatures. 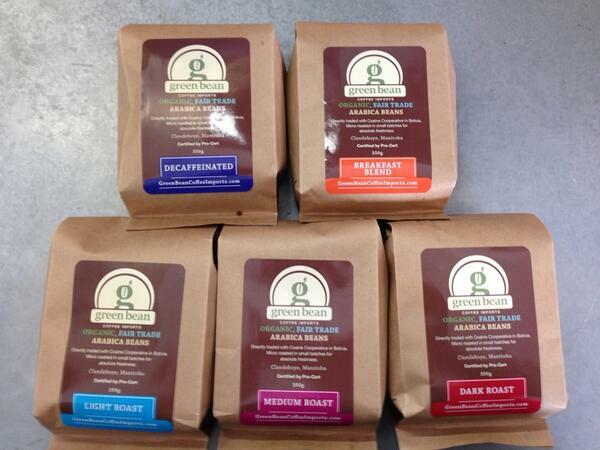 To sample this wonderful coffee, please visit Green Bean Coffee Imports. 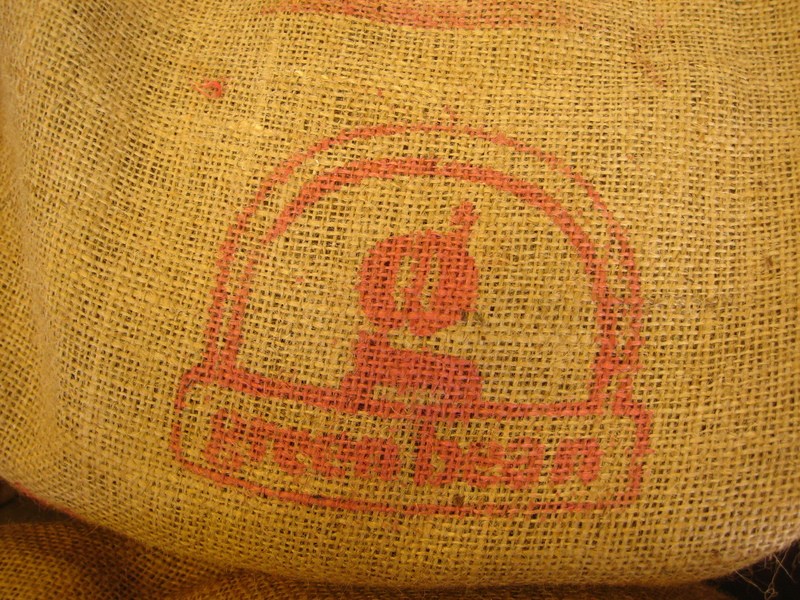 They boast a selection of roasts as well as green (non-roasted) beans for sale. Their website even has handy tips such as how to home-roast coffee beans. Who knew you could roast your own coffee in a popcorn maker?! 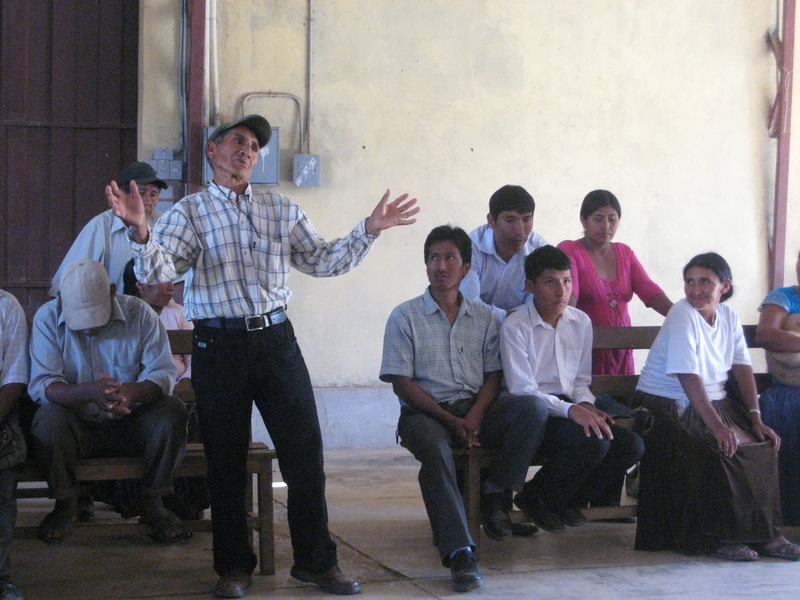 Not I.
Crossroads International is currently seeking a volunteer Fair Trade Advisor to manage the next phase of the fair trade project I am working on, thus ensuring its long-term sustainability. 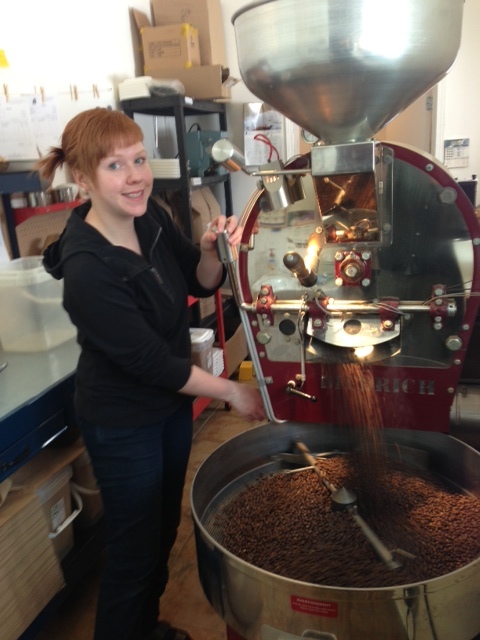 The week-long visit with our Canadian micro-roaster culminated with the signing of a contract, a decidedly positive accomplishment for all involved. 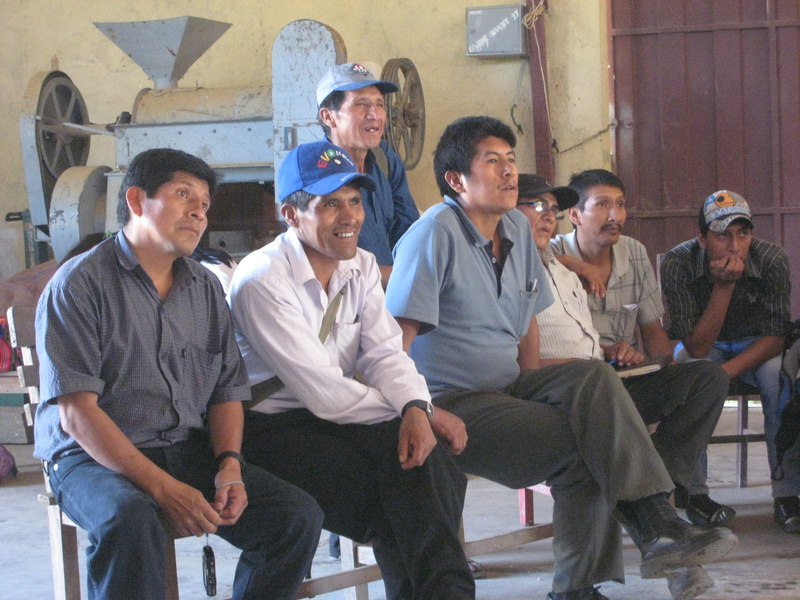 In brief, the history of the fair trade project I am supporting is such that over the past year, Crossroads facilitated North/South and South/North visits, enabling Canadian coffee roasters to visit a coffee cooperative in Bolivia and vice versa. 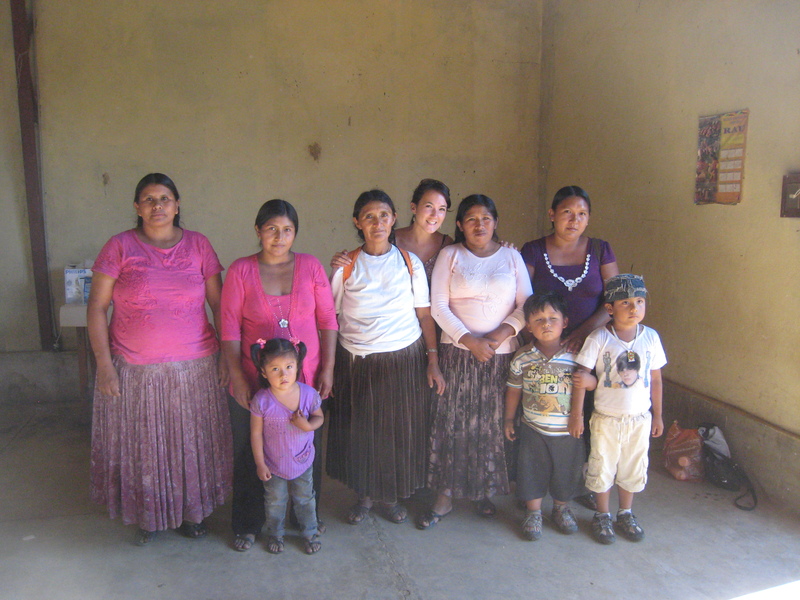 COAINE cooperative consists of 250 members, impacting more than 500 families. 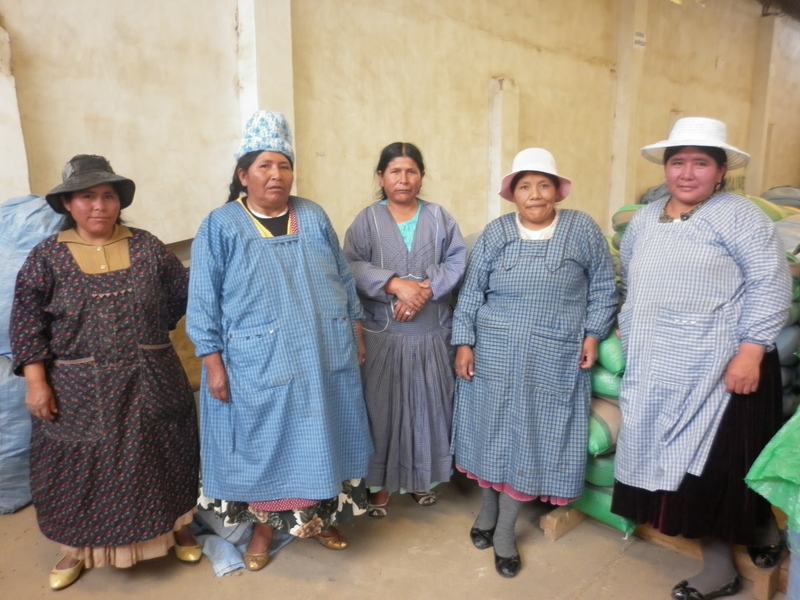 FONCRESOL (a micro-finance institution in La Paz that promotes economic and community empowerment in marginalized communities) collaborated with COAINE, offering them vital access to a loan in order to finance shipping costs and thus export their premium coffee at market price. As a result – and with considerable support from my volunteer predecessor – it was with great excitement that COAINE`s first export to Canada took place earlier this year. 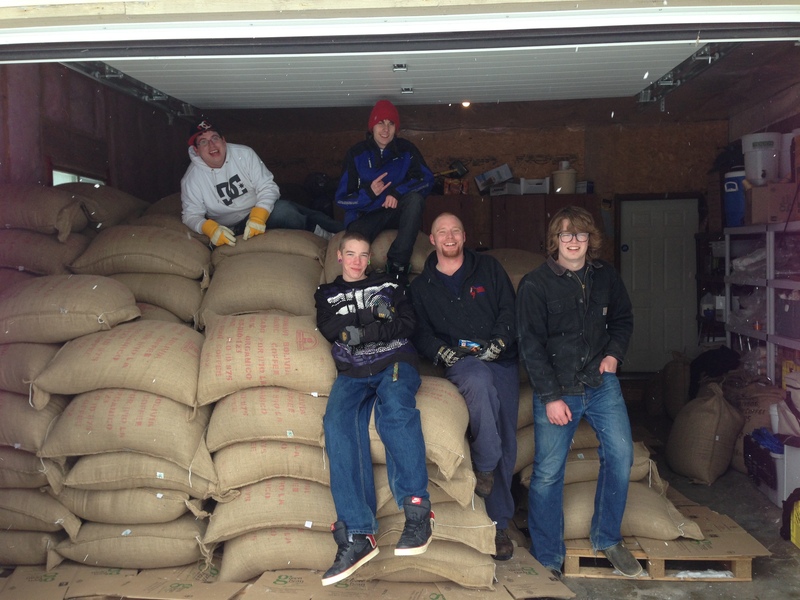 Derryl Reid of Green Bean Coffee Imports was one of 5 Canadian micro-roasters who collaborated to purchase the first container. 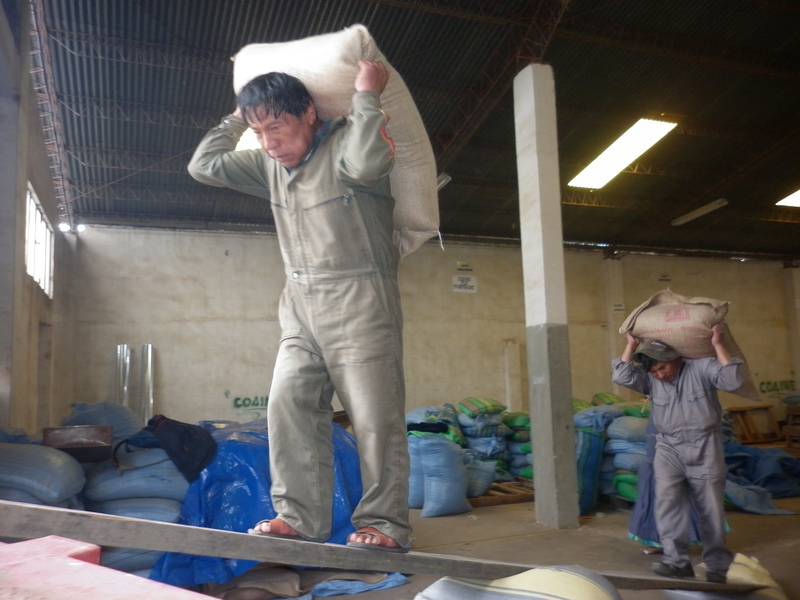 This month, Derryl was thrilled to return to Bolivia and commit to importing an entire container (in this case, 260 x 60kg bags). 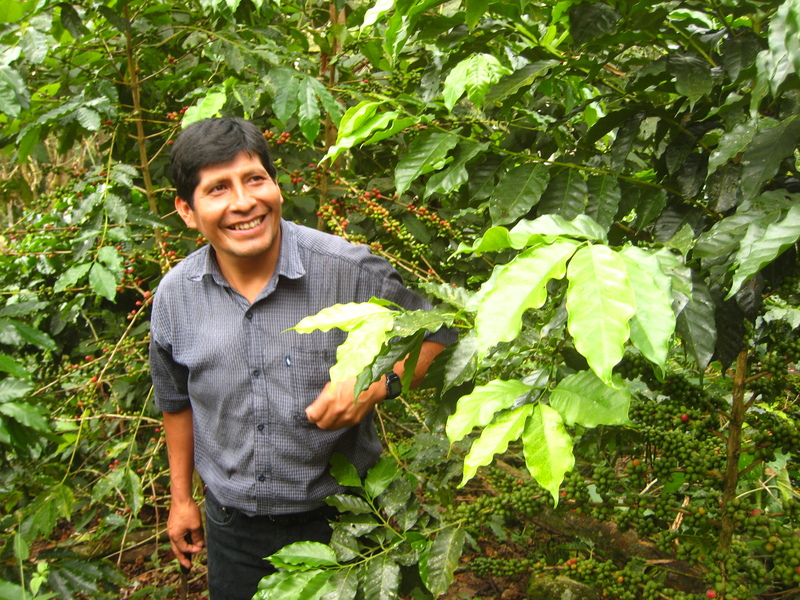 Since April, Green Bean has switched over to buying and selling uniquely Bolivian coffee. 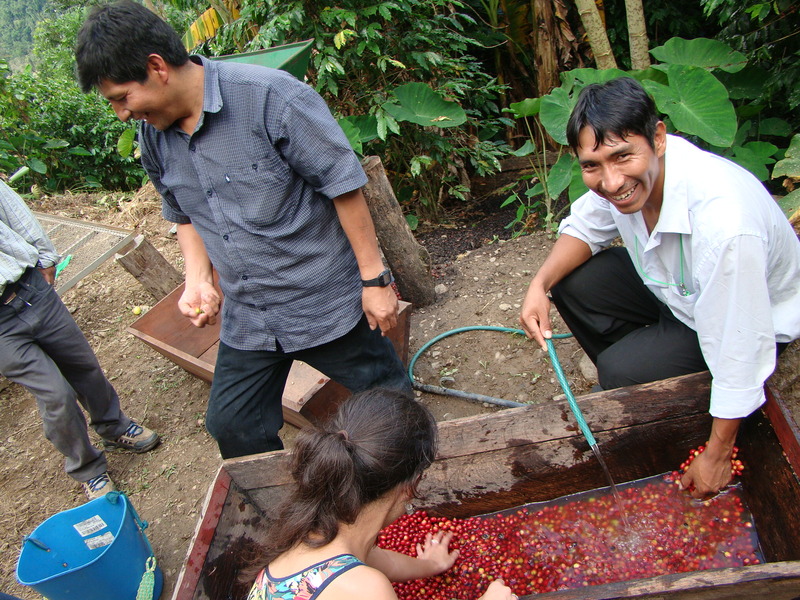 Having a direct relationship with the coffee producers he works with is key for Derryl and it was evident both parties are learning and growing together as their friendship and business relationship flourishes. 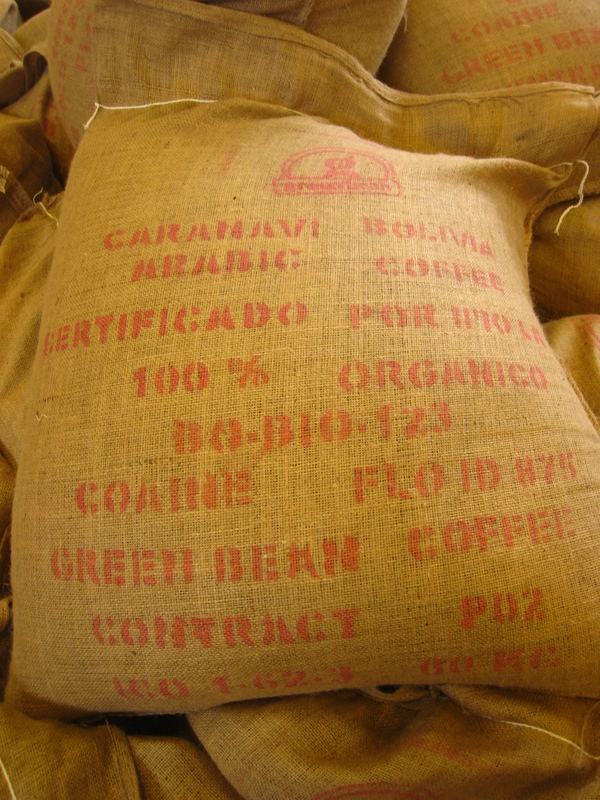 Both organic and Fair Trade certified, COAINE produces high quality, 100% washed Arabic Creole coffee. 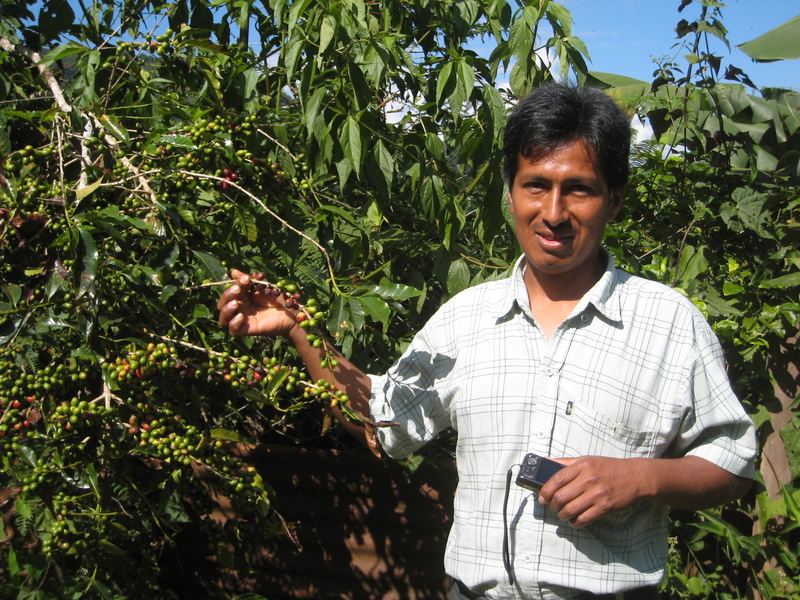 When asked what distinguishes Bolivian coffee from other varieties he has stocked in the past, Derryl cites its versatility: of a well-rounded quality, it balances the elements of aroma, body, flavour, acidity and sweetness. 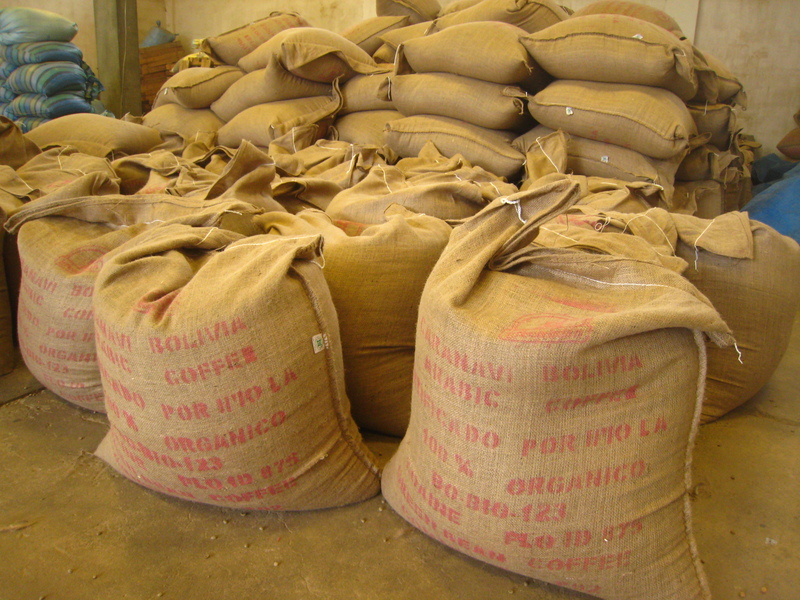 With a smooth, mellow favour, Bolivian coffee performs well when roasted at different levels and when blended. 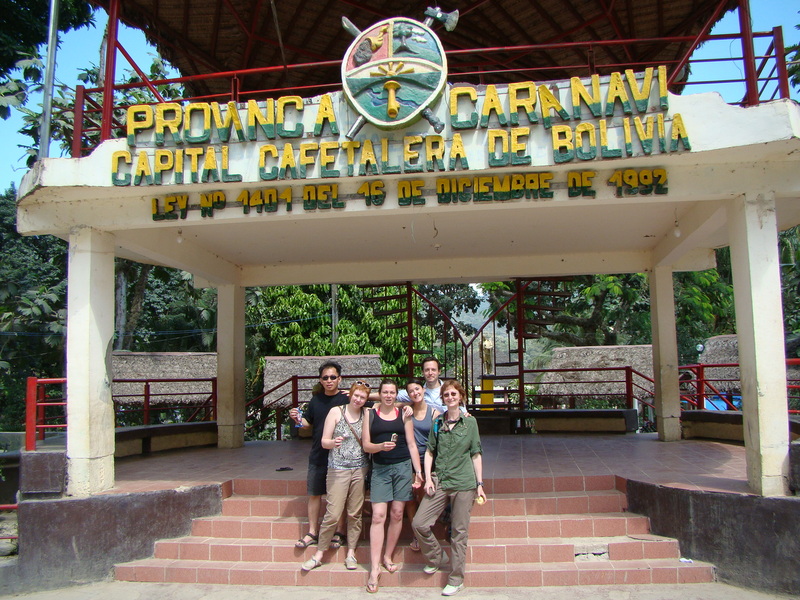 My destination after braving Death Road was Caranavi, coffee capital of Bolivia. 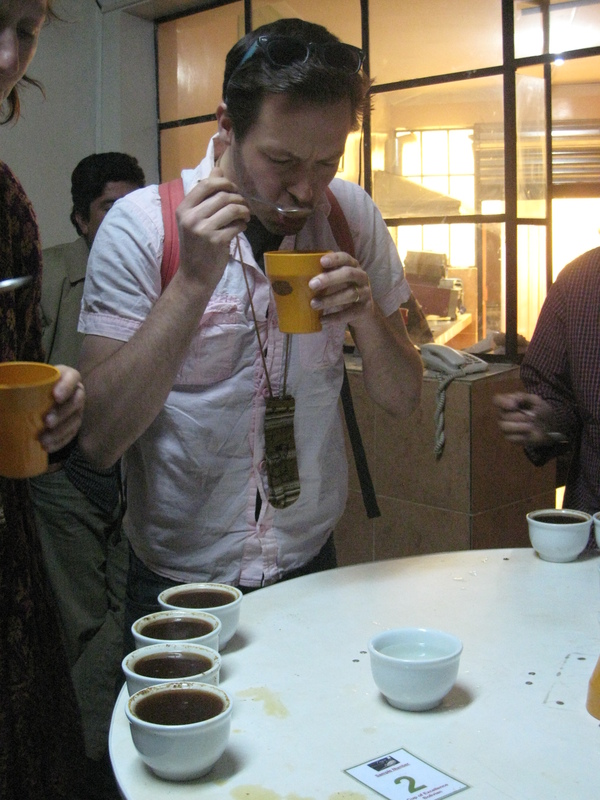 This was to be my first trip to the coffee production zone and my objective was two-fold. 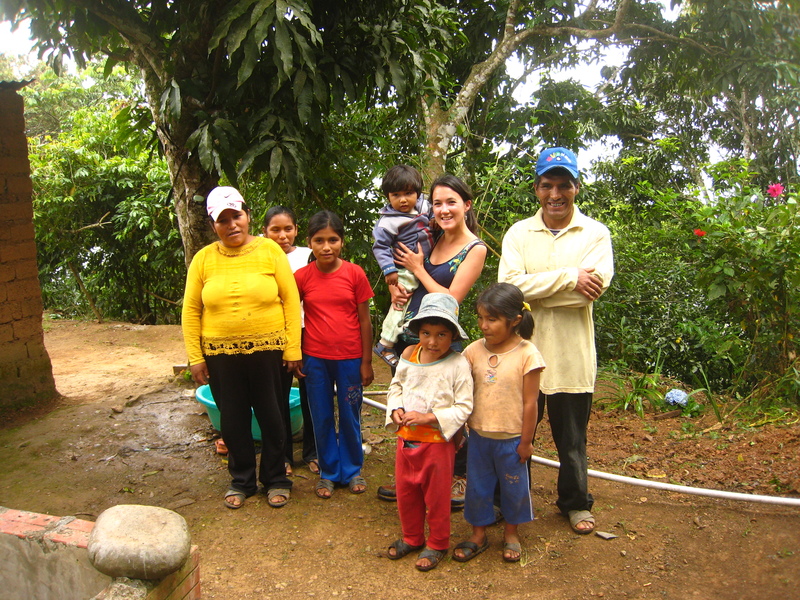 The first goal was to accompany a visiting Canadian coffee roaster, providing logistical support and translation throughout the trip. 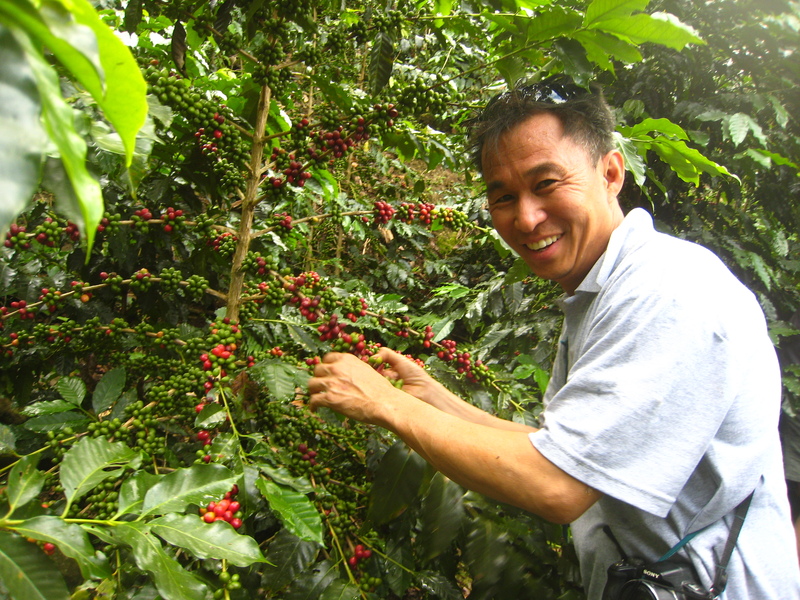 The second was to meet coffee farmers and scope out the various coffee communities in order to better understand the producers` needs for the marketing aspect of my role. 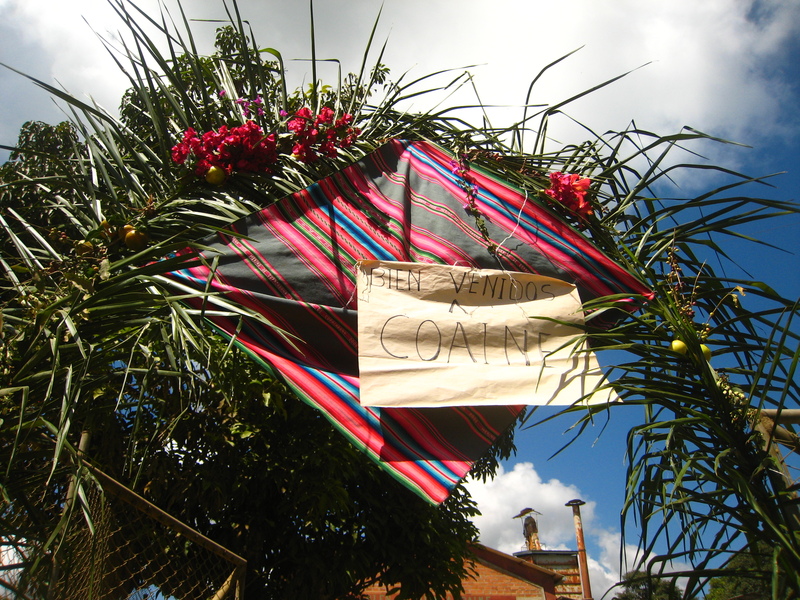 The town of Caranavi is located in Las Yungas, which is a transitional area between the highlands (La Paz) and the tropical lowlands of the Amazon basin. 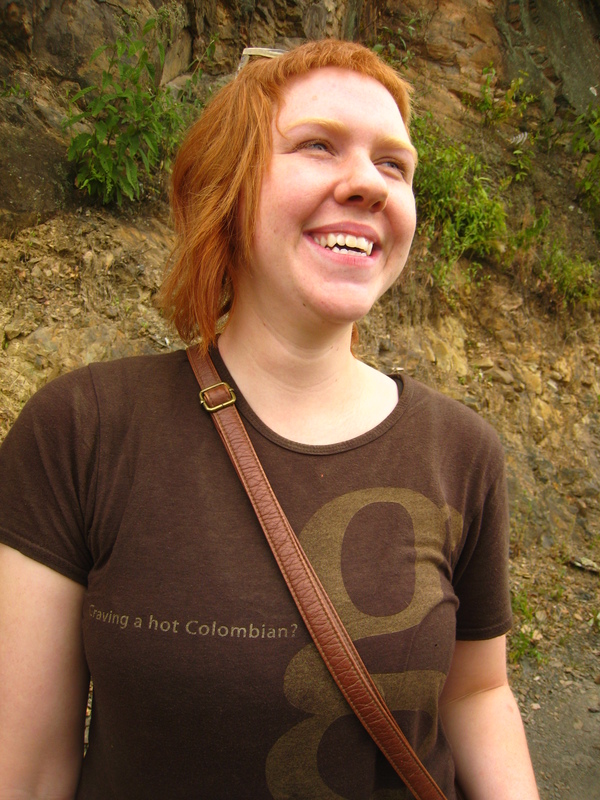 An entirely different climate than in La Paz, it was steaming hot and humid. 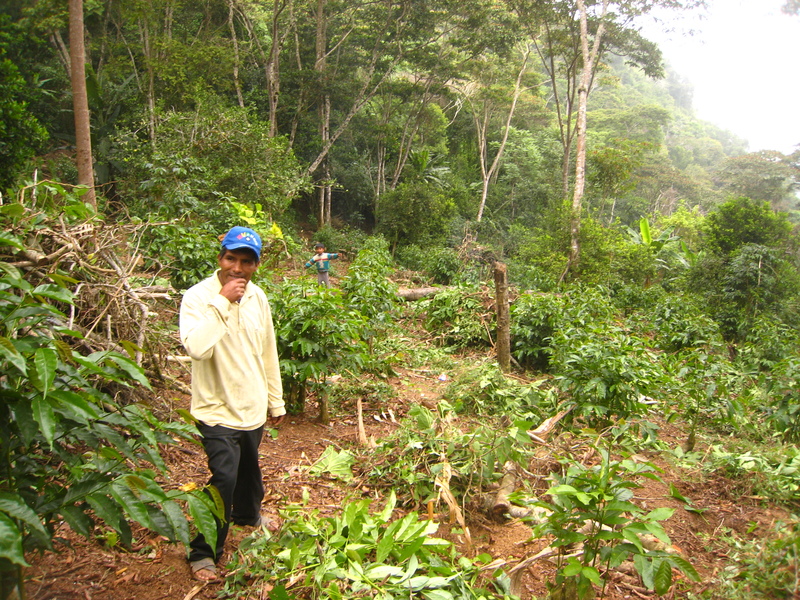 Most of the coffee producers live within the surrounding jungle area, a bumpy, dusty ride up into the hills. I found myself content to be in the tropics, far from the traffic and pollution of La Paz and it was sensory overload of the best kind. Incredible panoramas greeted us everytime we jolted to a halt (transporting up to 4 passengers in the car boot at any time). Sprawling hills of lush green vegetation spread for miles. 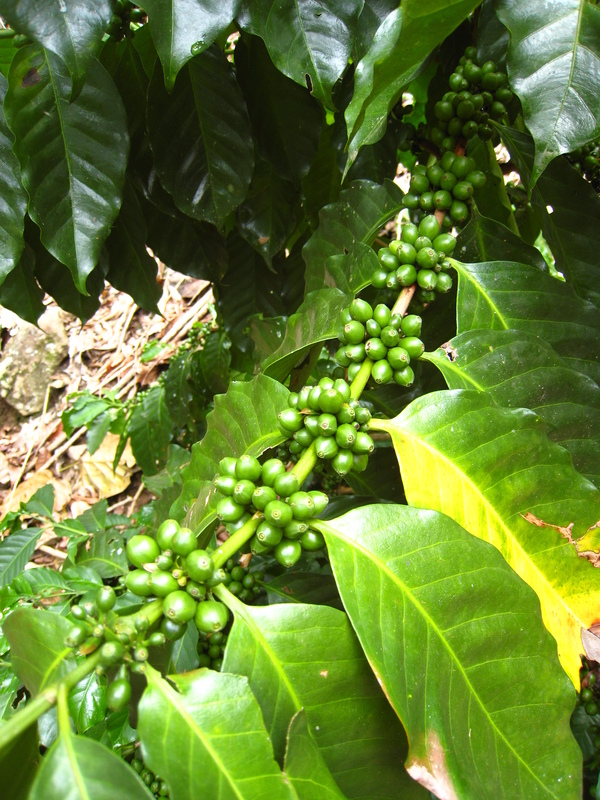 Coffee colonies, coca fields and fruit trees abound, boasting bananas, mangoes, avocados, mandarins, limes, oranges and papayas. Butterflies of electric blue, violet and yellow are bigger than birds. The air is heavy and humid, smelling of fruit and earth, and filled with the constant buzzing and chirping of birds and insects. It was worth the unnerving journey, without a doubt. 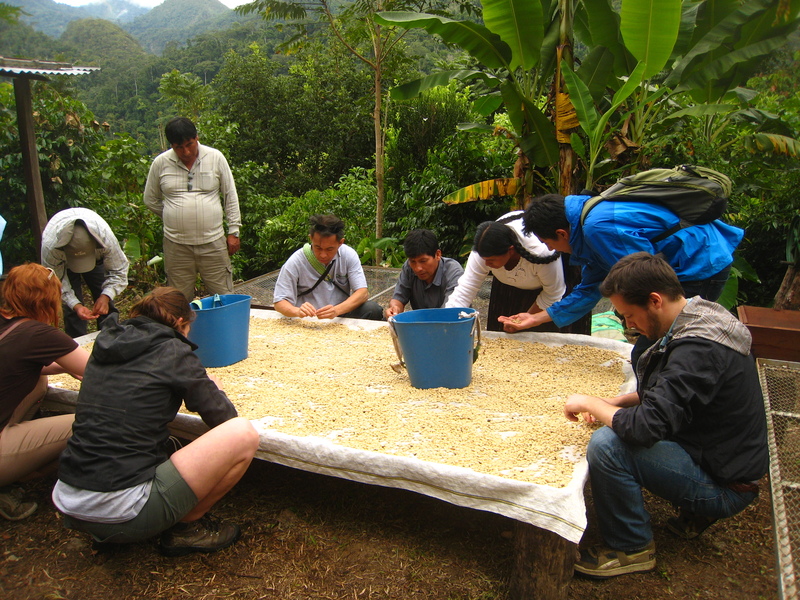 Naively, I thought that while volunteering with coffee farmers, drinking top quality coffee would be a daily occurrence. Not so! The coffee available here is instant Nescafé. The good stuff is exported since the price is better on the international market. 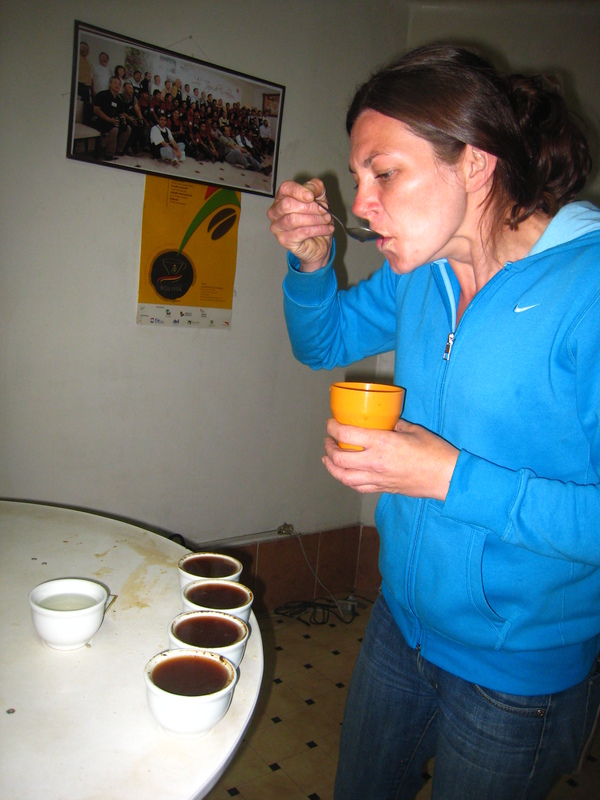 Besides, Bolivians tend to opt for drinking mate (tea). 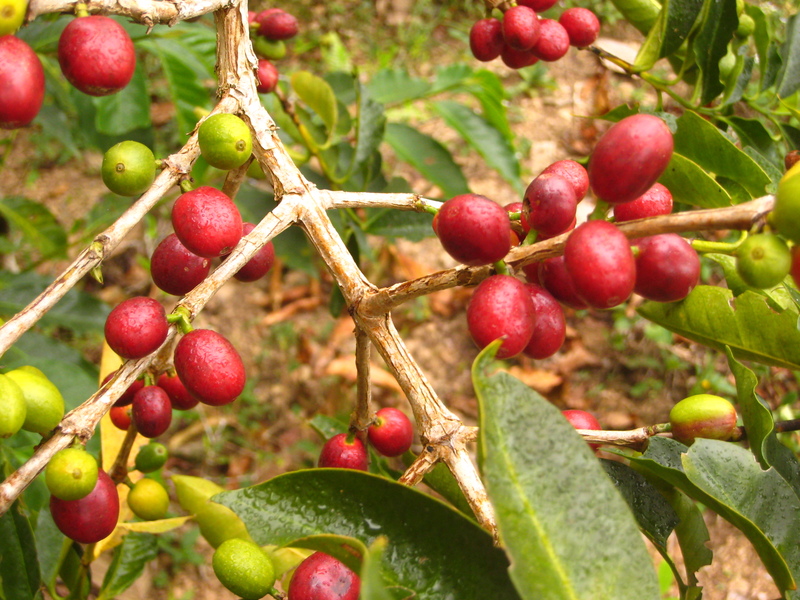 Thus I find myself on an unexpected caffeine detox, missing my usual allongés, but happily developing a taste for coca mate.